Heading into the North End, I was very curious to see my old stomping grounds, at least at Brookside Park and Terrace Lane. 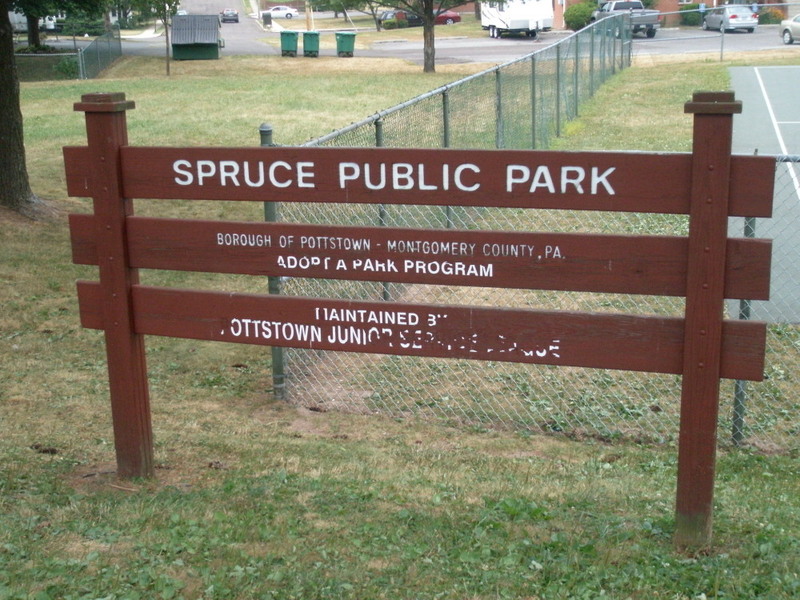 When I was growing up – um – several decades ago, the Pottstown Parks and Recreation Department ran programs out of all the parks and elementary schools. My home base was Franklin School. That’s where I learned how to weave potholders and tie-dye t-shirts, and every day kids of all ages swarmed the playground. One of the most exciting events of every summer – and these were very rare – was when one of the school’s maintenance men worked on the roof and started throwing down all the balls that had been hit, kicked or thrown up there over the past year. 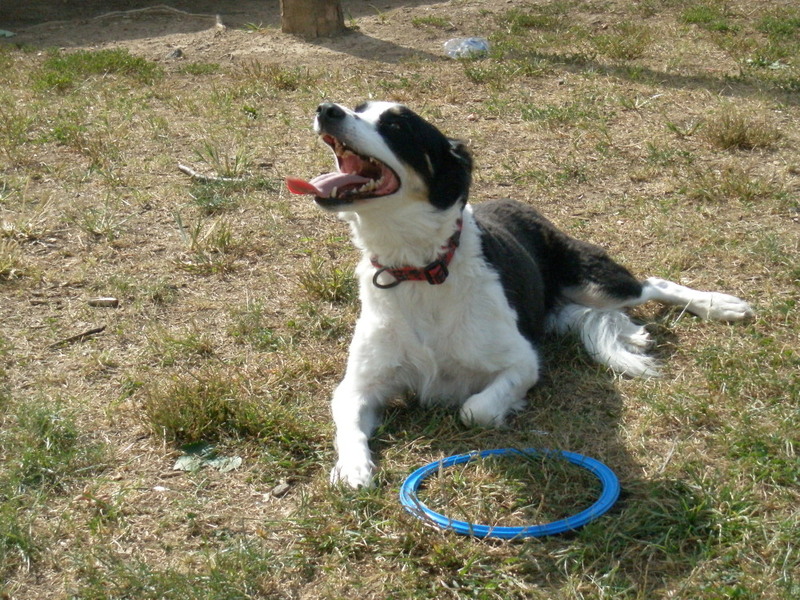 Baseballs, rubber balls, kick balls, tennis balls, even Frisbees, came raining down like manna from heaven. For sports lovers, it was truly a miracle. 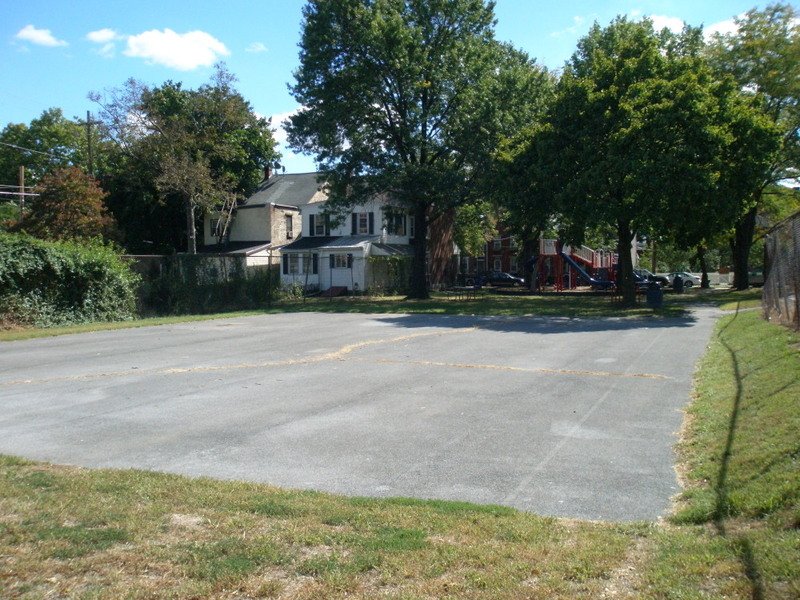 Excitement also came from kickball games against other nearby playgrounds, including Brookside and Terrace Lane. I remember walking to each of those parks for some spirited competition, although I don’t remember any of the outcomes. 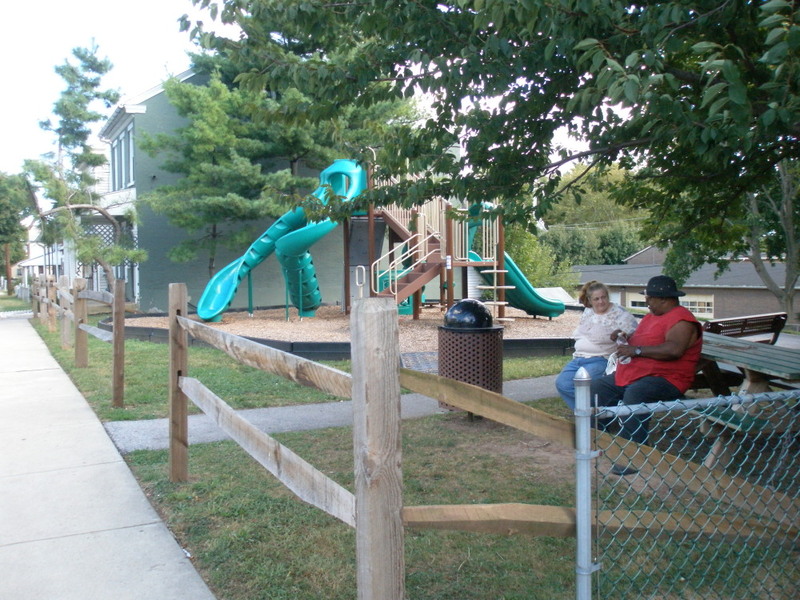 Recently, Terrace Lane got a whole new look: new play equipment, swings, bike racks, benches, a pavilion and tables. The faux wrought iron fencing that runs along the curve of Terrace Lane gives this park an especially attractive street view. I grabbed my ball from my car to give the small half-court and hoop a try. Ah, yes. The blacktop slopes downward toward Brookside. You have to use your legs more, the further you step out, to overcome that slope. And the left side of the rim is slightly higher. On that side of the court, you have to give your shots just a little more arc to clear the rim. This all came to me in a matter of seconds. Is it possible it’s the same hoop I shot at all those years ago? The muscles remember these things. Spruce Street Park was not on my radar growing up. It was a little beyond the radius I moved in around my home. 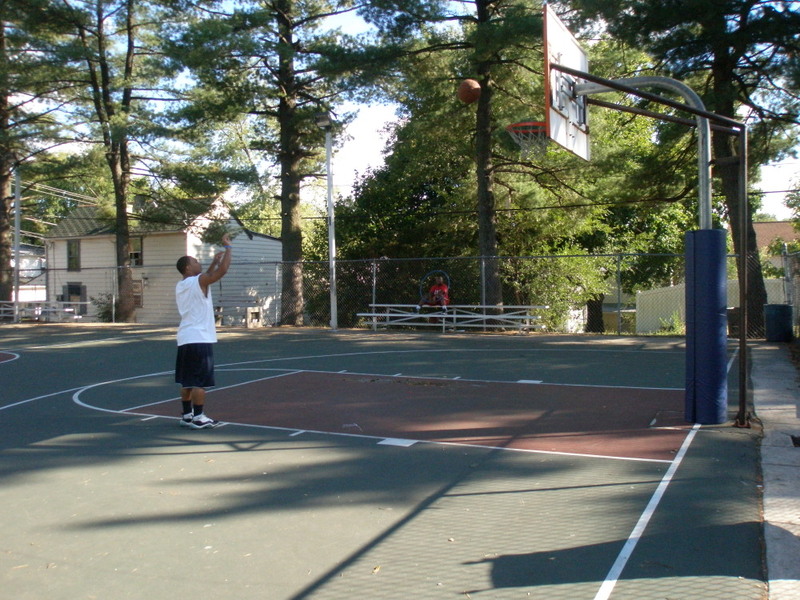 I never ventured too far for hoops back then; Franklin was where I always practiced. I do remember coming home from college and hearing my younger brother and sister talking about the great basketball being played at Spruce Street, especially in the summer. I only played there a couple times, when I had come home for Christmas with my husband, and the weather was so warm that we all put on shorts and t-shirts and got in some games. The two full courts at Spruce Street still seem to be the place to find a good run, while the adjacent tot lot will appeal to the younger crowd. Location: It’s tucked away in residential area with streets on 3 sides: Hale Street, Virginia Avenue and Brookside, Pottstown, PA 19464. 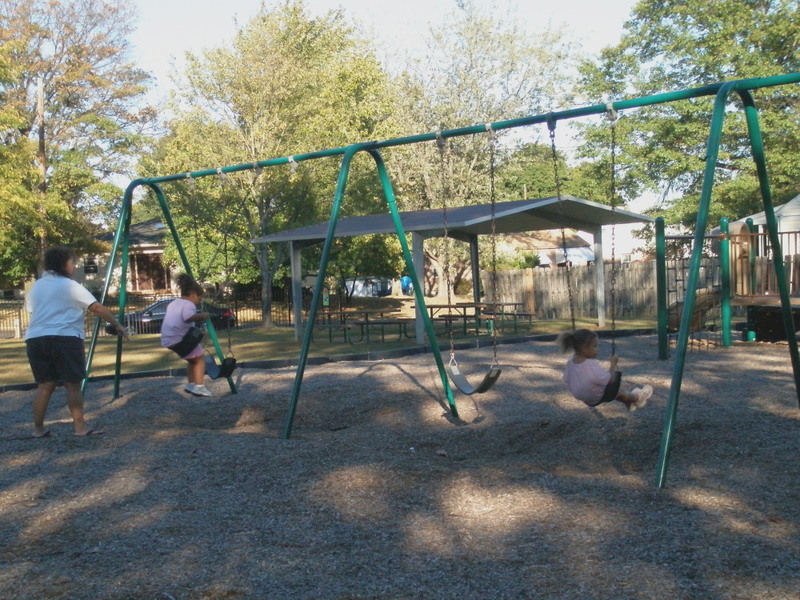 Facilities: Playground, swings, multi-purpose open space, small pavilion & tables, basketball court. 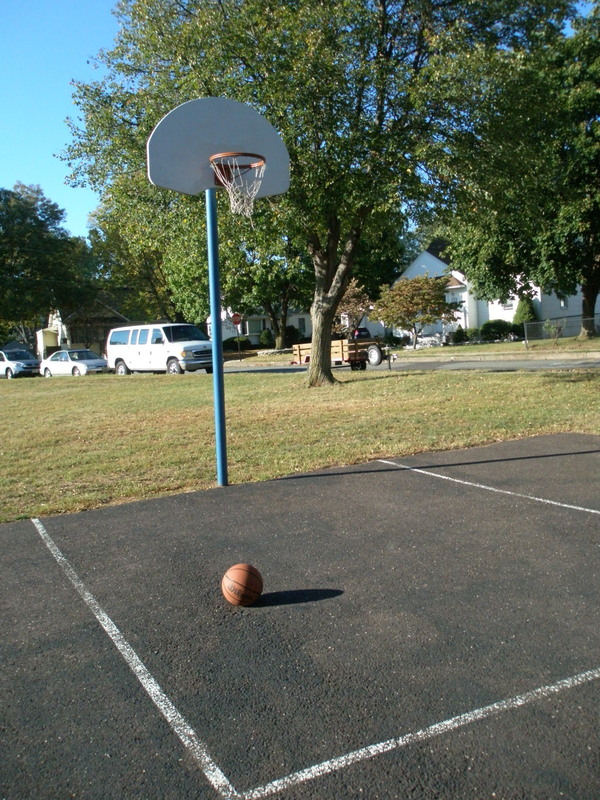 Activities + tips: On the b-ball court, use those legs, lift that ball up on your shots! Location: On the curve of Terrace Lane, near the intersection with N. Adams Street, Pottstown, PA 19464. 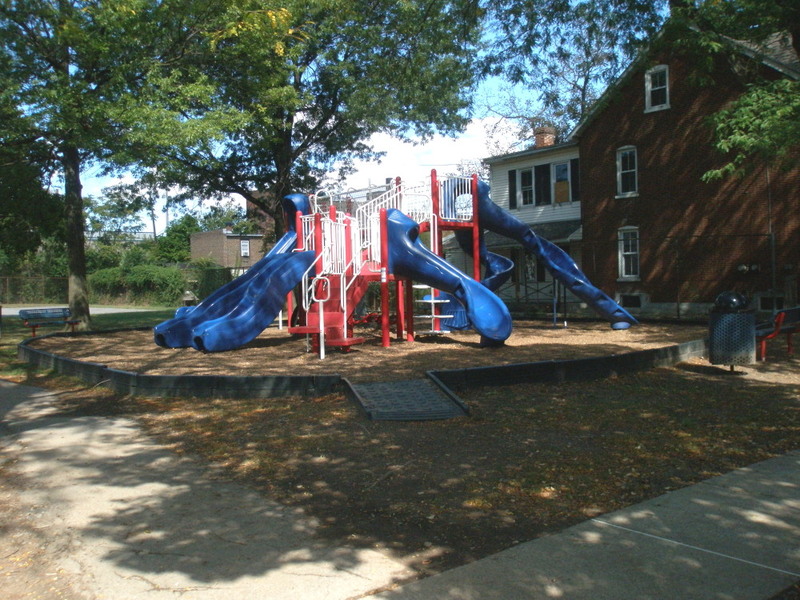 Activities + tips: This park can also be accessed from the alley between N. Warren St. & Terrace Lane. Location: Spruce Street, near intersection with Wilson Street, Pottstown, PA 19464. When you see the car wash, turn towards downtown Pottstown; park will be on your right. Suitability: Active and passive recreation for all ages. 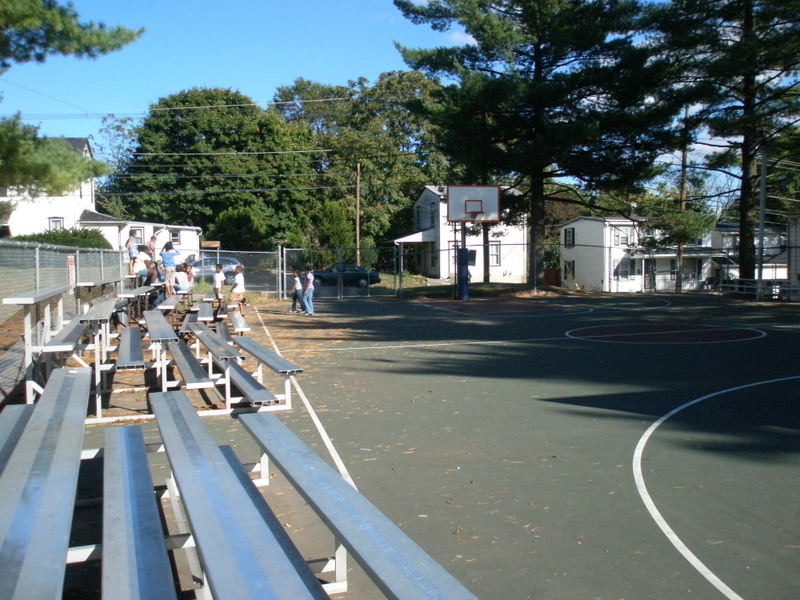 Facilities: Playground, multi-purpose open space, 2 full-courts for basketball. 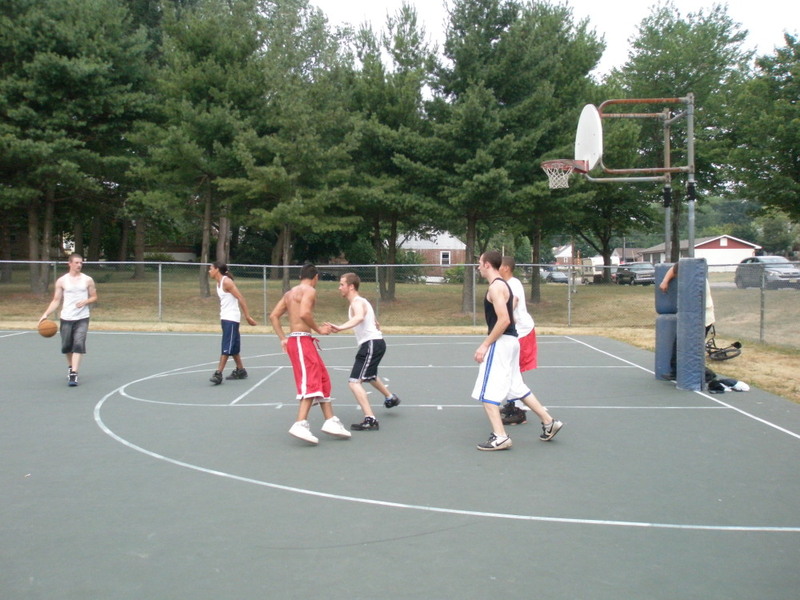 Activities + tips: These courts are popular with ballers; courts tend to attract older teens & adults. 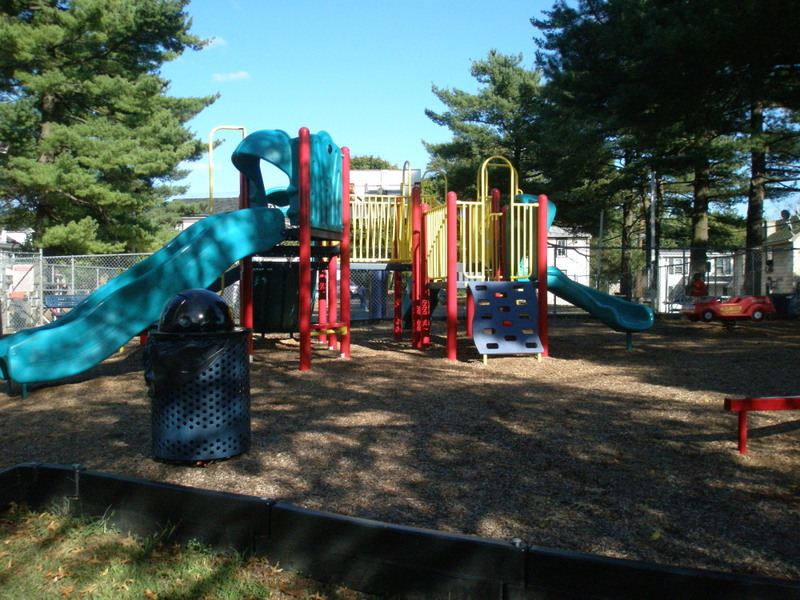 Parents will want to accompany their younger children to the tot lot. 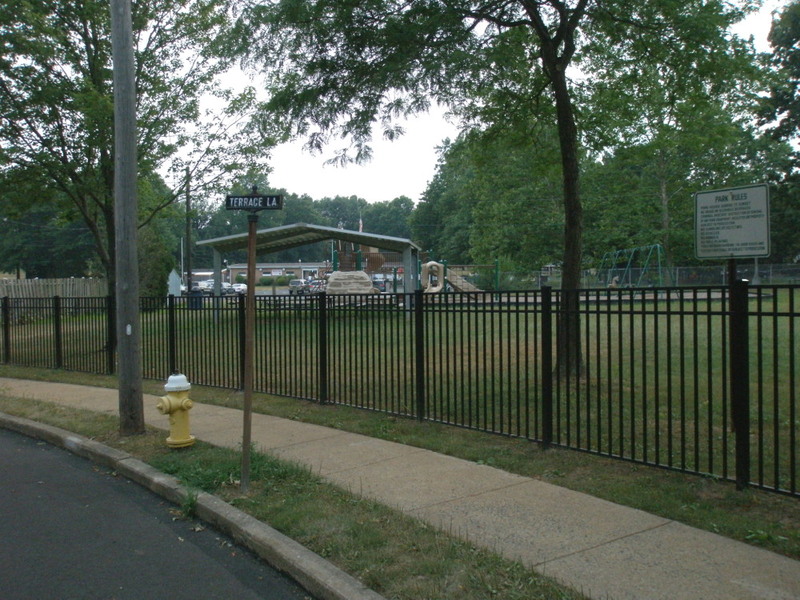 After Riverfront Park and Memorial Park, Pottstown’s next biggest recreational space is Maple Street Park, which encompasses 6.3 acres in the East End. 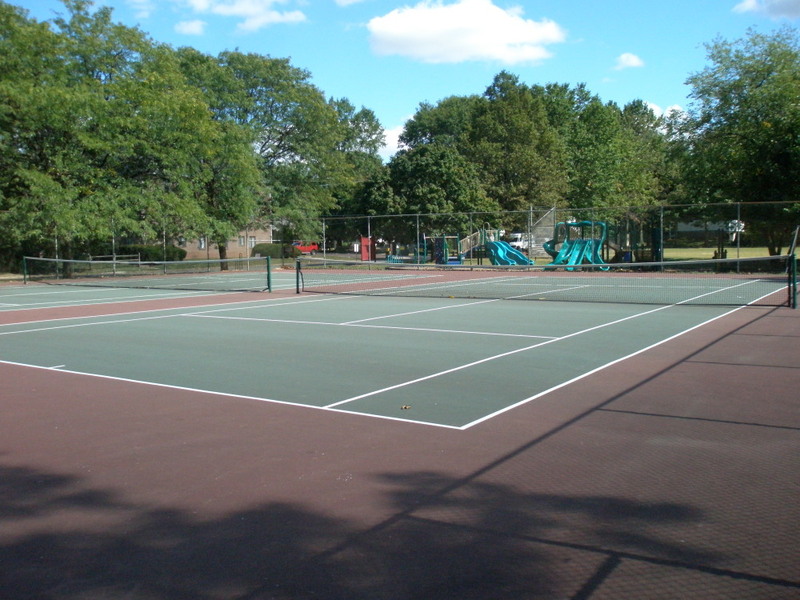 The facilities are in excellent condition and offer a good mix of active and passive recreation for all ages. 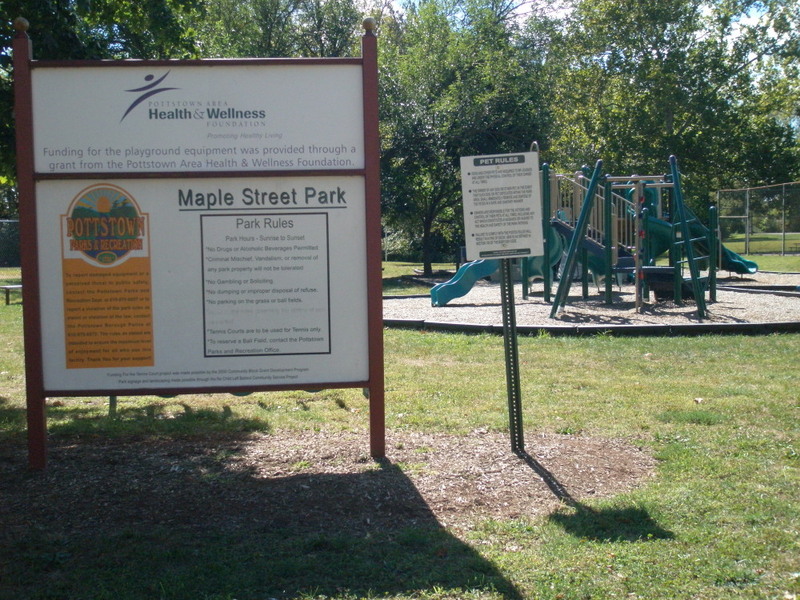 As seen in the sign to the left, the Health & Wellness Foundation, the sponsor of this blog series, also funded the playground equipment at Maple Street Park through their grant program. 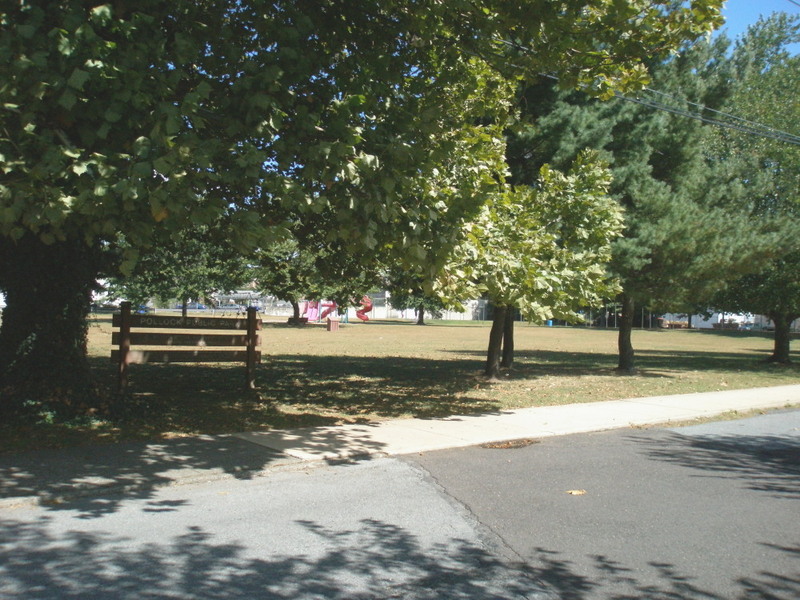 The two ball fields are used by the Pottstown Little League for baseball and softball. 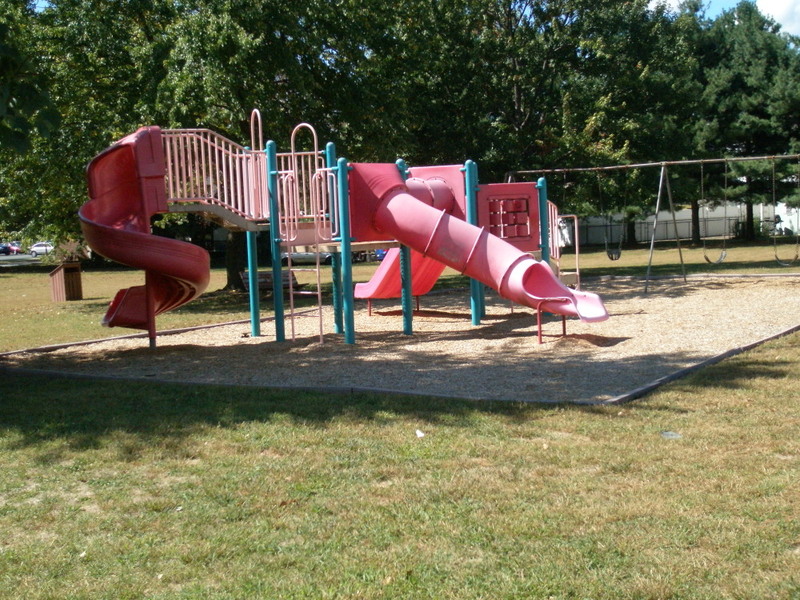 In addition, there are bike racks, two tennis courts, picnic tables set amidst large trees, and a large playground area that has all kinds of equipment for swinging, climbing, crawling and sliding. I did NOT try this slide. When I call 9-1-1, it’s going to be for a good reason! 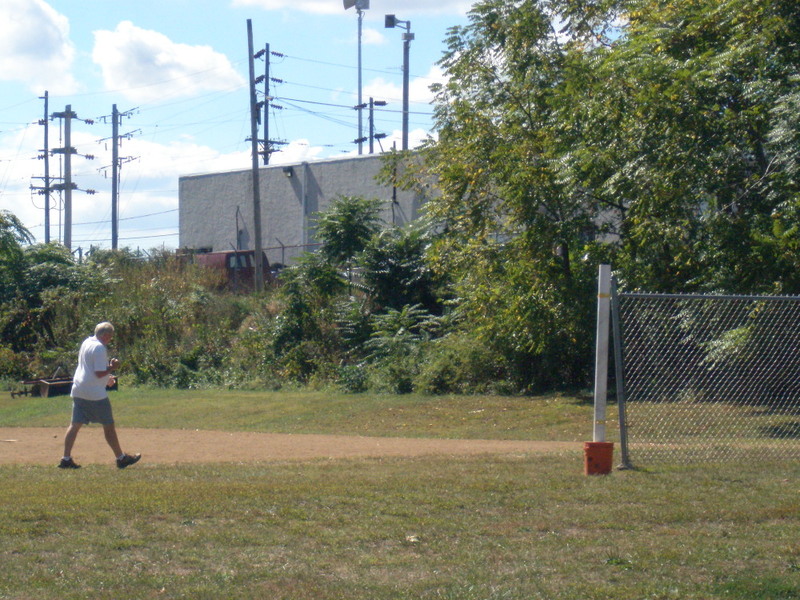 On one of my visits to Maple Street Park, it was the early afternoon and the man in this photo could be seen doing lap after lap of moderately-paced walking around one of the ball fields. It just goes to show that you can make a workout happen anywhere if you’re determined to do it. 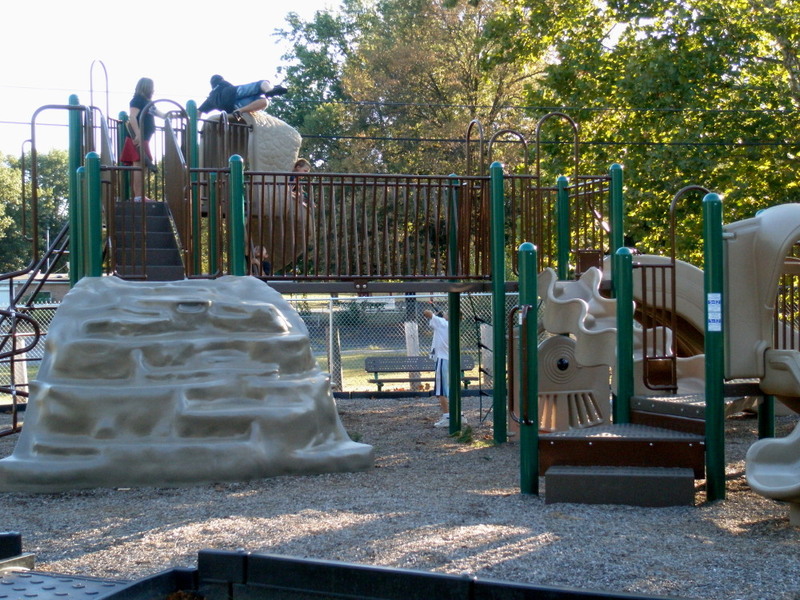 Inside sources tell me that Maple Street Park is truly a neighborhood, family hang-out. 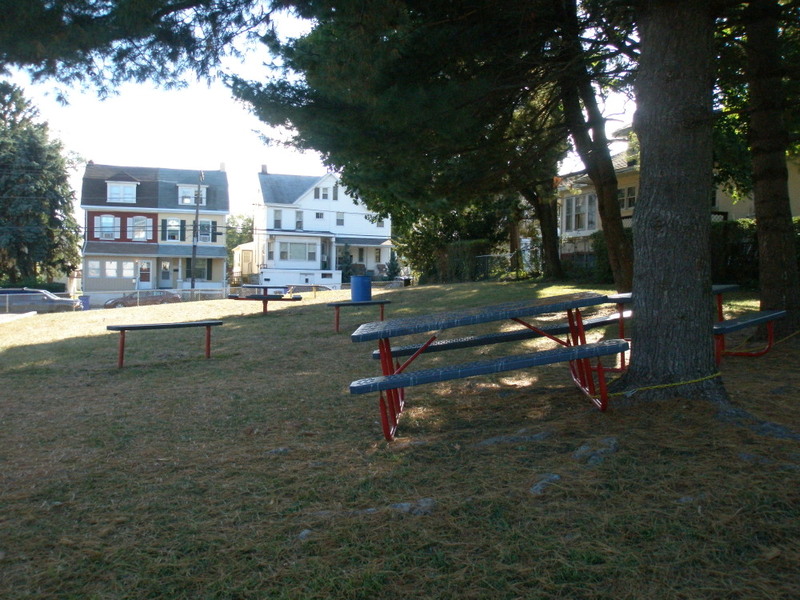 Across the street are the Maple Court Apartments, and its residents, who don’t really have backyards, can be found using the park for exercise, dinner and relaxing. On summer evenings, the park is filled with adults and children of all ages. And the Walking Club at nearby Rupert School holds their end-of-year picnic there, making this East End gem the kind of place that just about does it all, giving residents of all ages opportunities for physical activity, social connections and contact with nature. Location: On Maple Street near the intersection with St. Clair St. Use 1431 Maple Street, Pottstown, PA 19464 if you want to find it on a GPS. That’s the address of Maple Court Apartments, which are across the street. 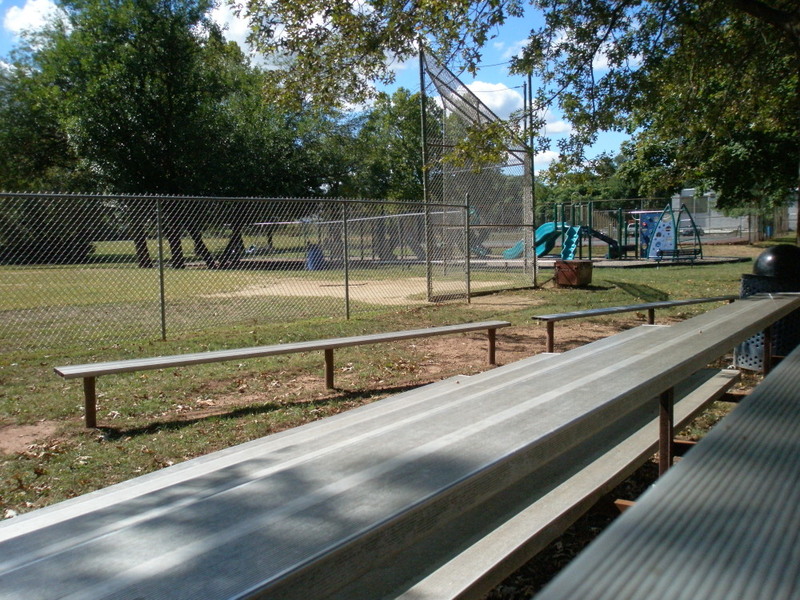 Facilities: 2 Little League fields, 2 well-maintained tennis courts, playground, swings, small and large multi-purpose open space, benches/sitting areas, picnic tables, mature trees in park and along edges. 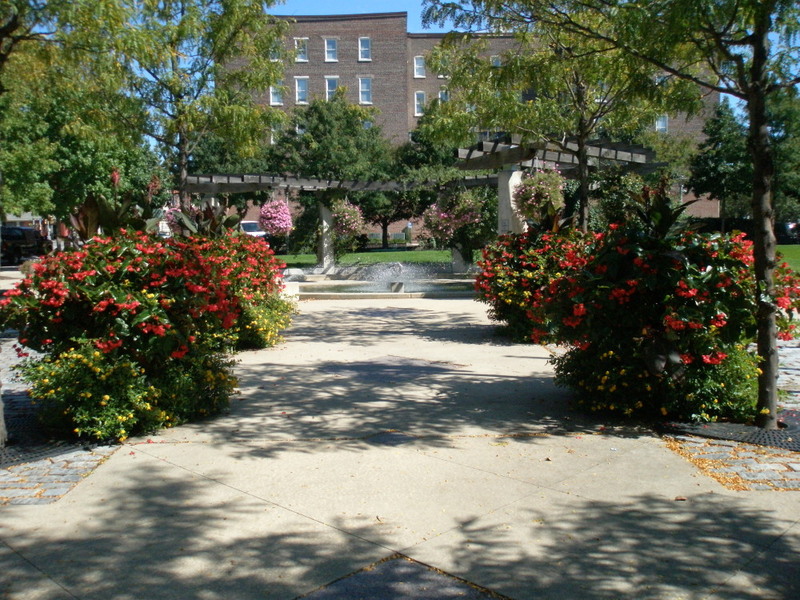 Activities + tips: To see this neighborhood park come alive, check it out on a summer evening. The Penn State researchers categorize parks that are less than 1 acre in size as mini-parks or pocket parks. 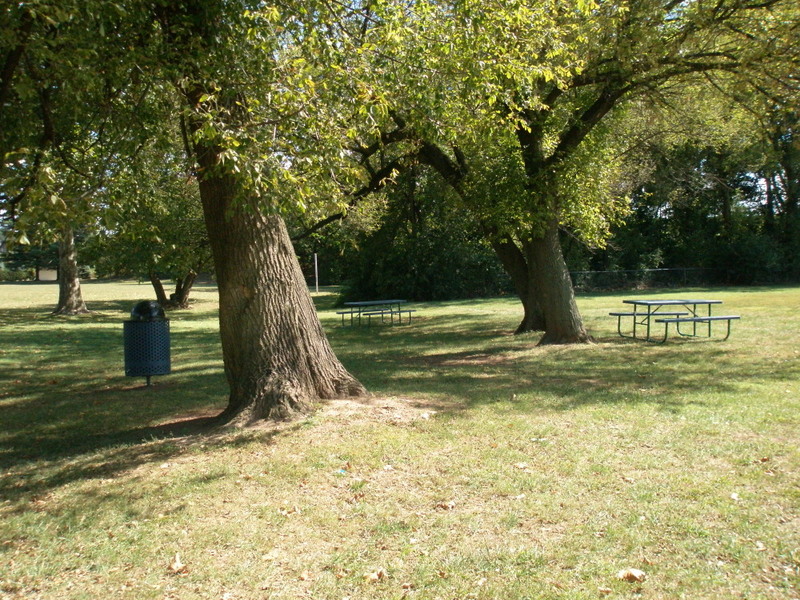 Pottstown has many such parks scattered throughout the Borough. 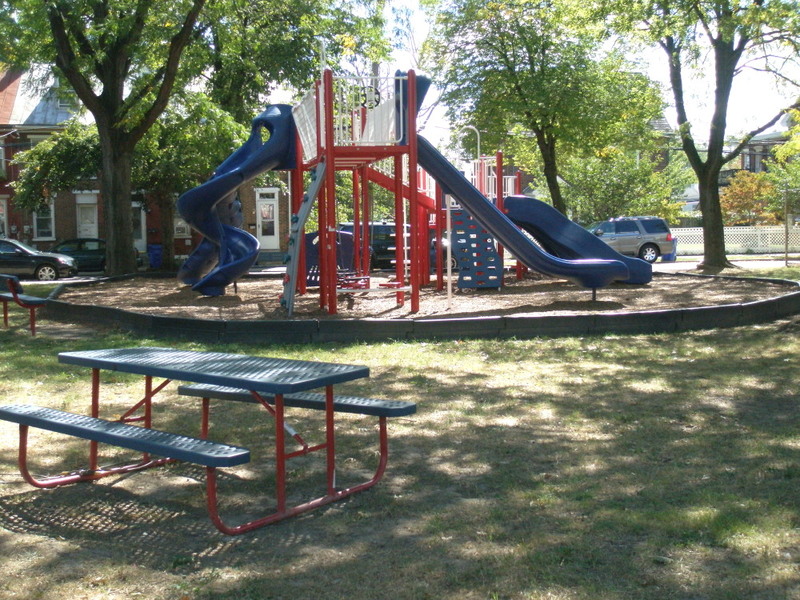 While it is desirable for every park to offer a range of opportunities for physical activity, social connections, contact with nature and elements that strengthen a sense of place, these mini-parks cater to children and typically include playground equipment set in mulch, perhaps a bike rack and some benches or picnic tables. 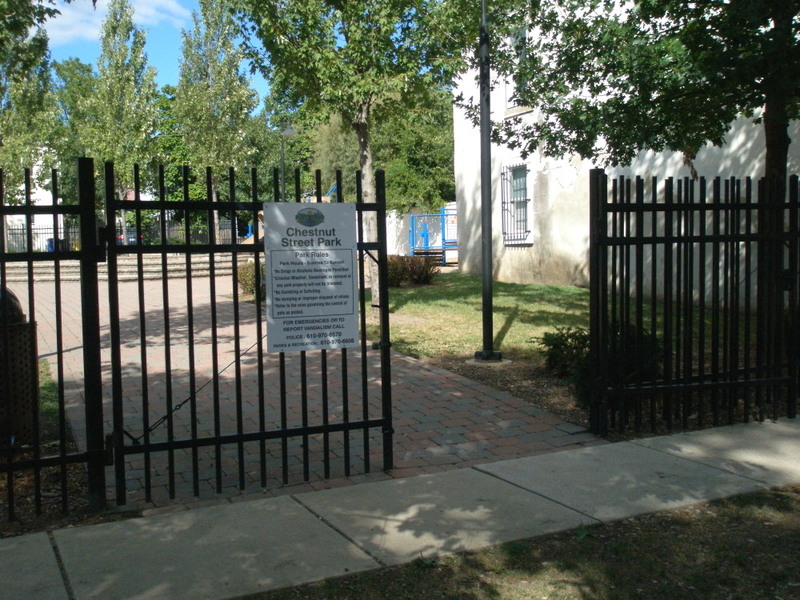 In general, Pottstown’s pocket parks are clean and have an open feeling to them with good visibility from the street. 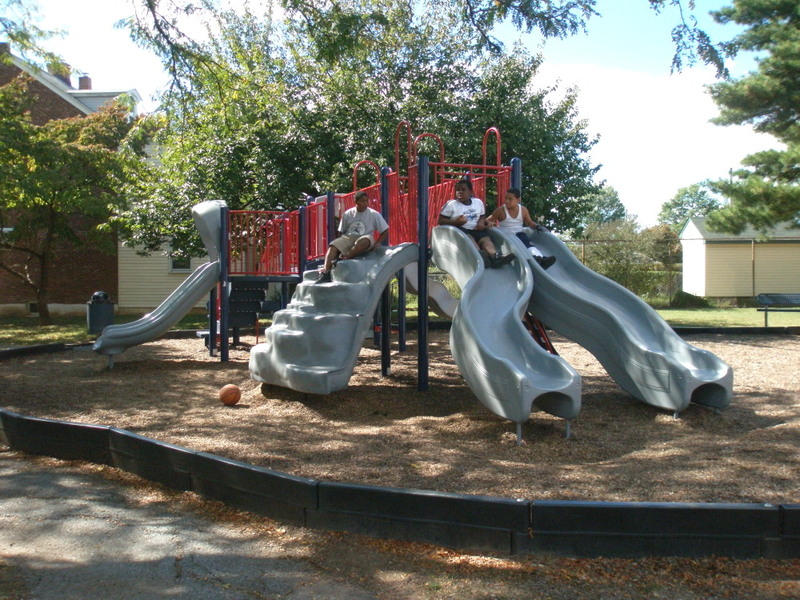 The equipment is practically new, colorful and cheery, providing active play space in neighborhoods that have fairly dense housing, narrow lots and small backyards that are not adequate for the personal play equipment that can be found on large, suburban lots. 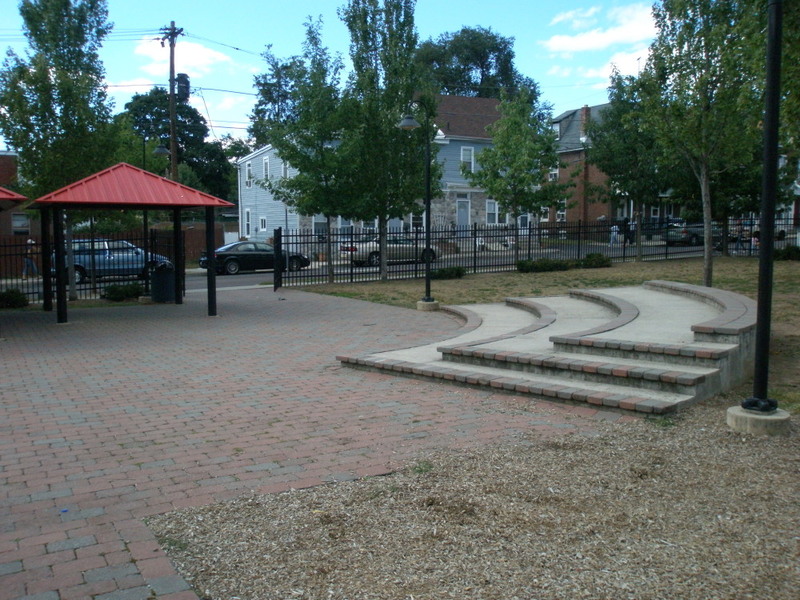 These spaces serve as neighborhood gathering spots for independent children as well as for parents and children together. 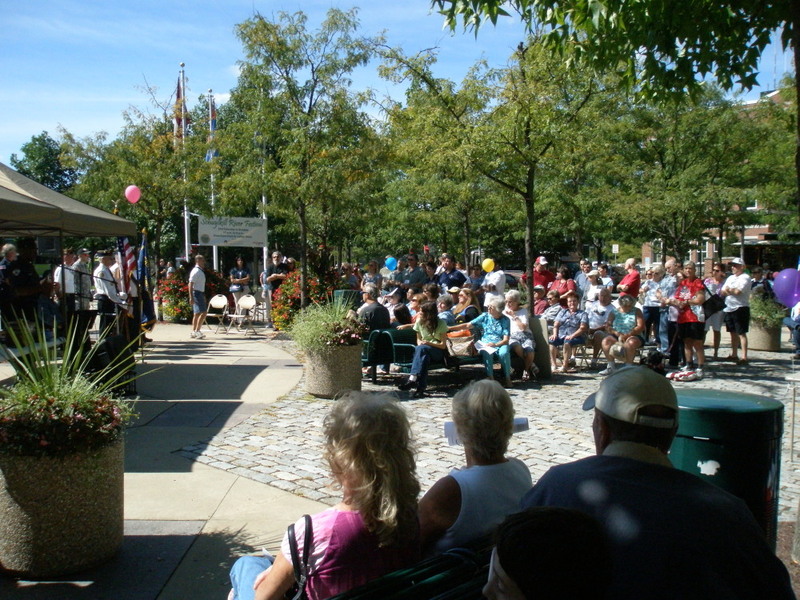 In central Pottstown, there are two parks that fit this description and one, New Chestnut Street Park, which offers even more possibilities for social connections. 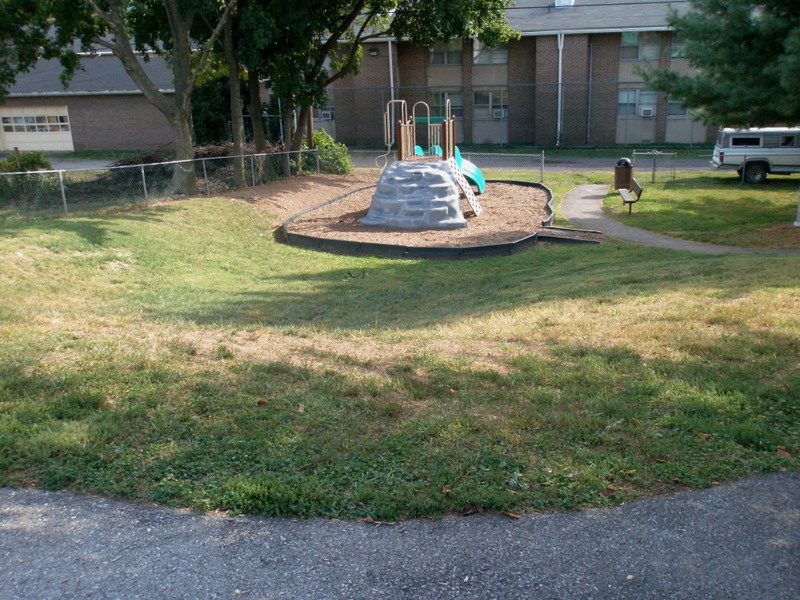 Walnut Street Park is on Walnut between Grant and N. Adams Streets. 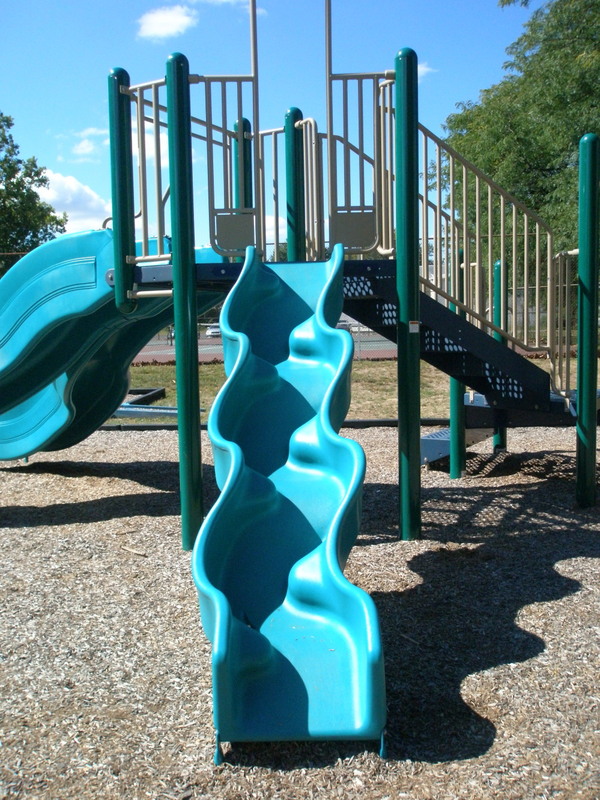 The interesting feature of this park is the dramatic slope between the two play areas, creating lower and upper playgrounds. From the street, it looks like there’s just one play area, but if you go inside the park just a few steps, you’ll see another play area down below, which can also be accessed from Rowan Alley. Some local residents in the park the day I visited said it’s the best sledding in Pottstown! (1) I had promised the Health and Wellness Foundation that we would try out important features of each park. 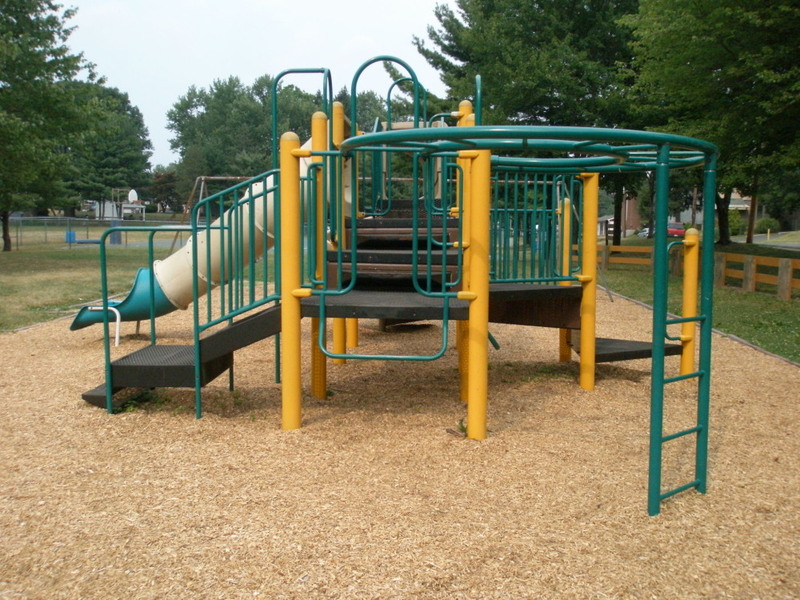 (2) When I was growing up, the high slide at the Franklin School playground was metal and, unless weather conditions were perfect and there was no humidity, it was hard to get in a good run. These new plastic slides send you flying! Washington Street Park actually lives on East Street, right at the “T” where that leg of Washington Street ends. 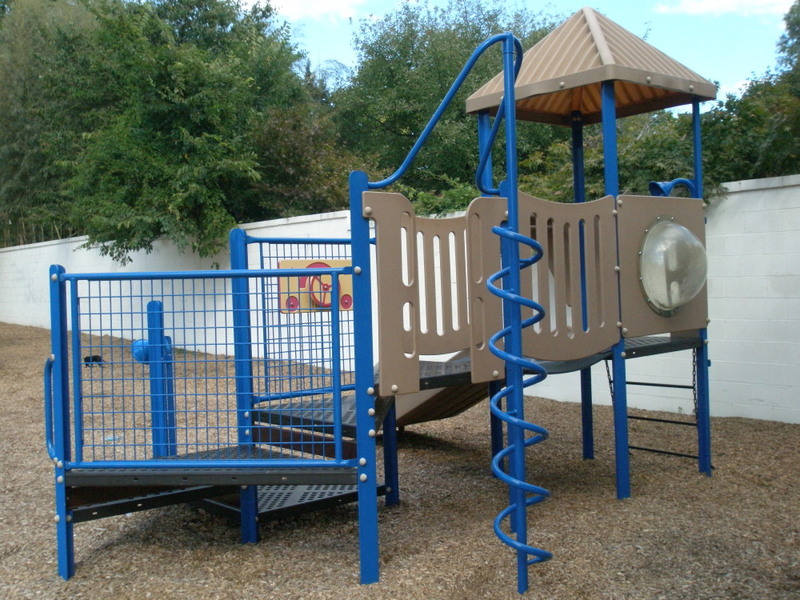 It also offers new, fun equipment and plenty of space for running around. A new chain link fence prevents the youngest children from dashing off the playground into the street. I took a few moments at the end of the afternoon to just swing, something I hadn’t done in a very long time. I’d forgotten how meditative it can be. 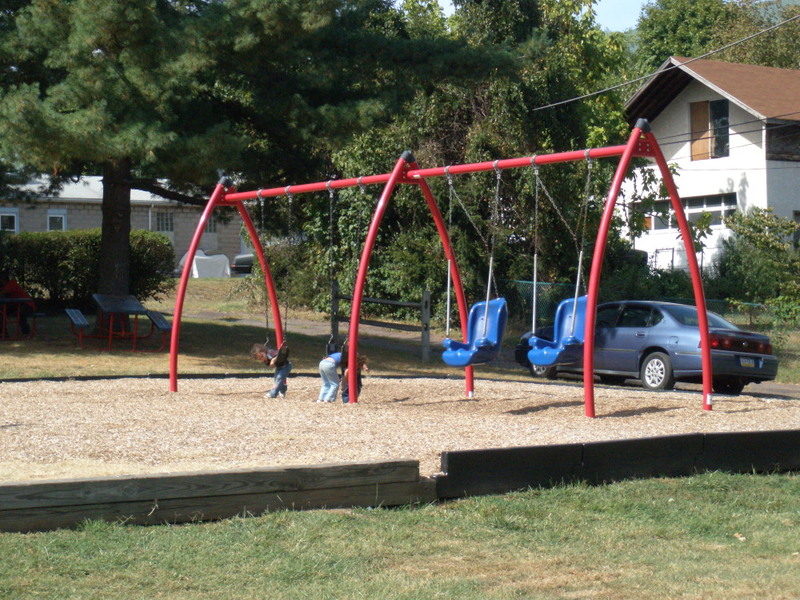 Adults: swinging is not just for kids! 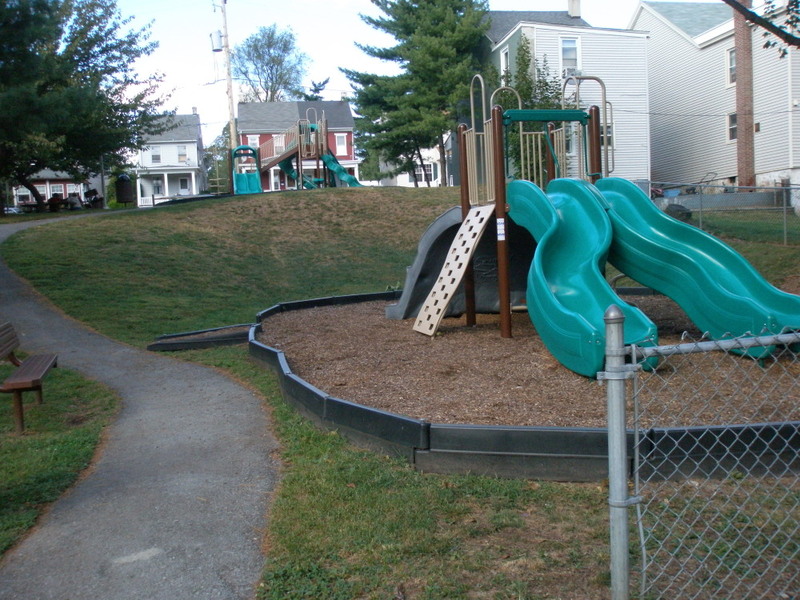 Heading down Washington Street, to the intersection with Chestnut, brings you to the New Chestnut Street Park. 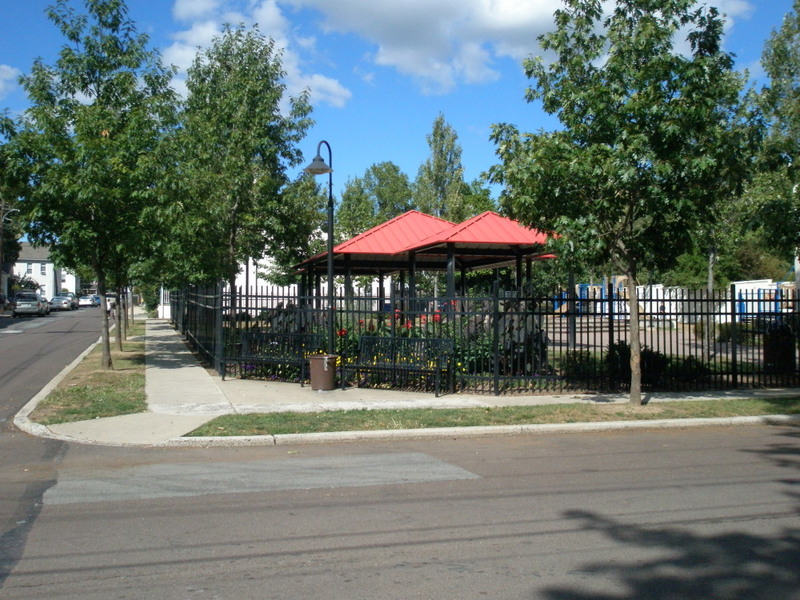 This very attractive, practically brand-new, fenced park has become a popular venue for community-wide events such as National Night Out, as well as for a local community gardening day and private parties. A few resident elders can usually be found on a bench right on the corner, keeping an eye on things. Because the park has a pavilion with access to electricity, it appeals to and serves a broad range of residents, not just children. It’s remarkable how the addition of that kind of equipment, which isn’t all that elaborate, can inspire wider and more frequent use of a pocket park. Something to think about if/when there’s funding for renovations or upgrades to other pocket parks in town. 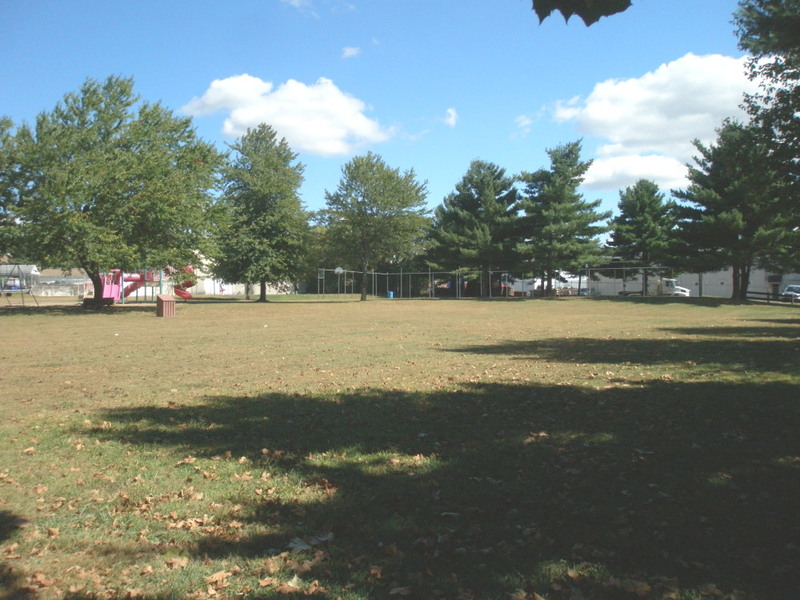 Now I just have to say a few words about the Old Chestnut Street Park, which appeared in the Penn State study but is now vacant. 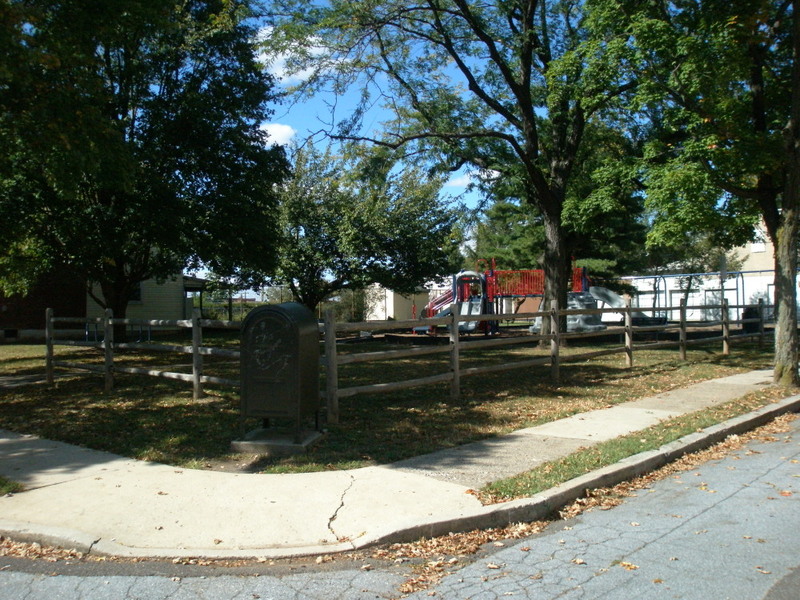 This quarter-acre park, which is on the north side of Chestnut Street, between Franklin and Washington Streets, is actually owned by the School District. This will be a site to keep your eye on as the School District conducts their facilities analysis because the idea of a community garden at this location has been floated out there by some neighborhood residents. This property also has an interesting history. As you stand at the park entrance and look across the street, you’ll see two really cool, brick buildings that used to be public schools; they’ve got red boards over the windows. 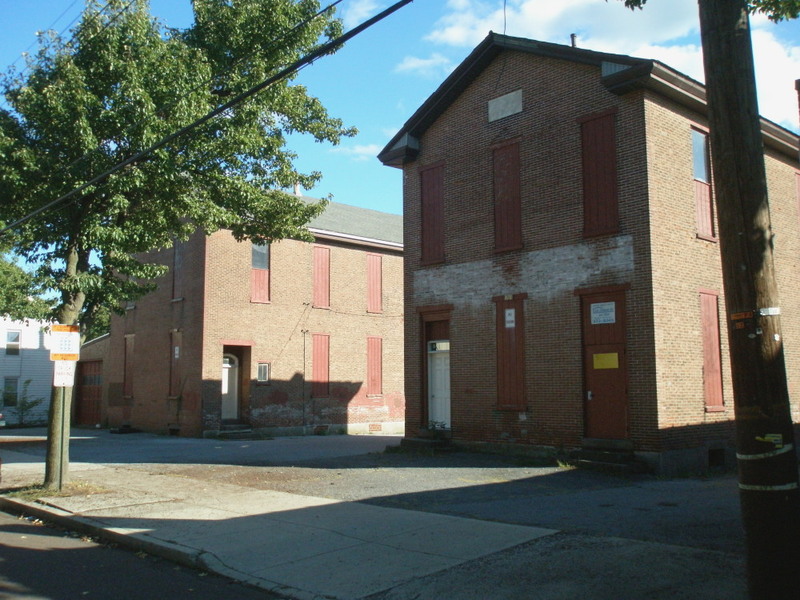 The one on the left was Hamilton School, built in 1881 (424 Chestnut), and the one on the right was Adams School, built in 1887 (420 Chestnut). While there are some clues on the buildings themselves, I consulted my handy Pottstown School Directory from 1892-93 that came in a small batch of things I won on eBay a while back. (I’ll eventually give this stuff to the Historical Society or the District, but I’m still working my way through it.) Anyway, this little book is filled with all sorts of interesting tidbits about the District, including the fact that there was a school called “Franklin” on the empty park site, way back in the 1890s. 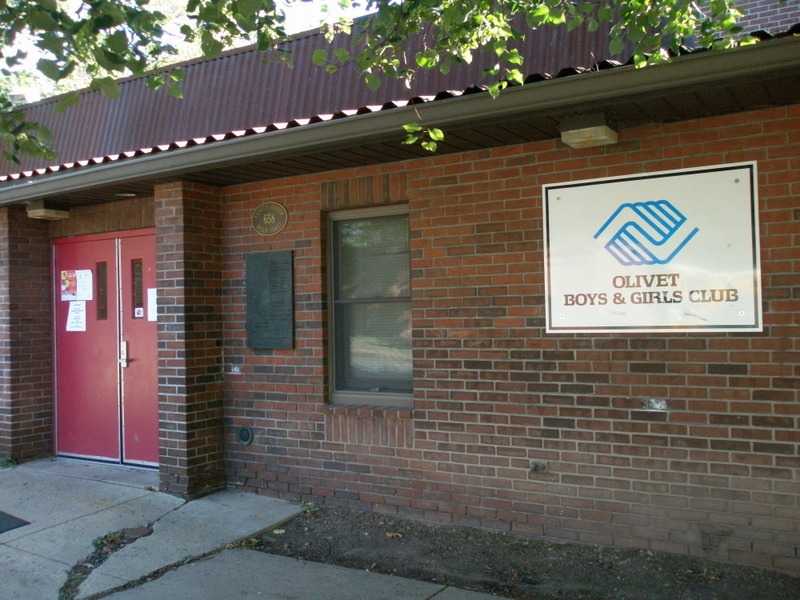 It seems to have had two second-grade classes, taught by Sue B. Fritz and Libbie Krause. Isn’t it kind of wild to imagine how every piece of land has its own history and its own stories to tell? Suitability: Approximately 5-12 years old. 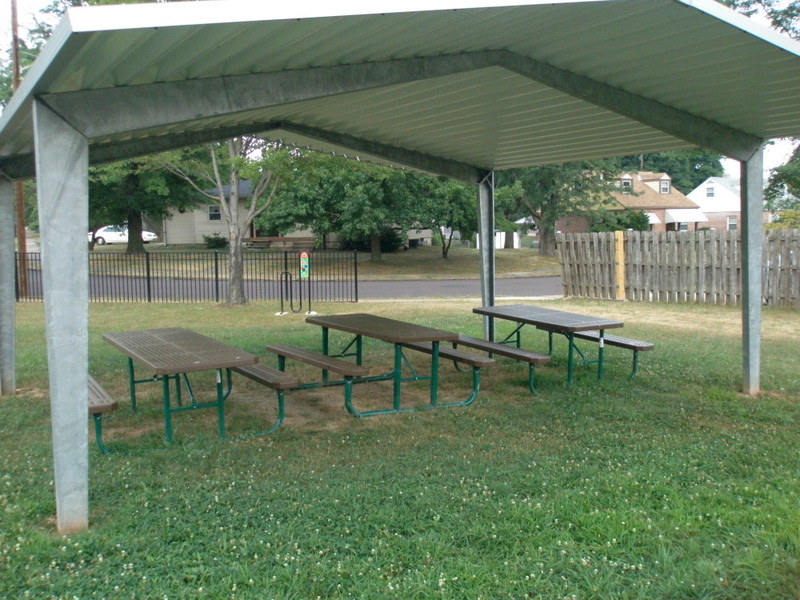 Facilities: Two play areas, picnic tables, benches; shady and sunny areas. 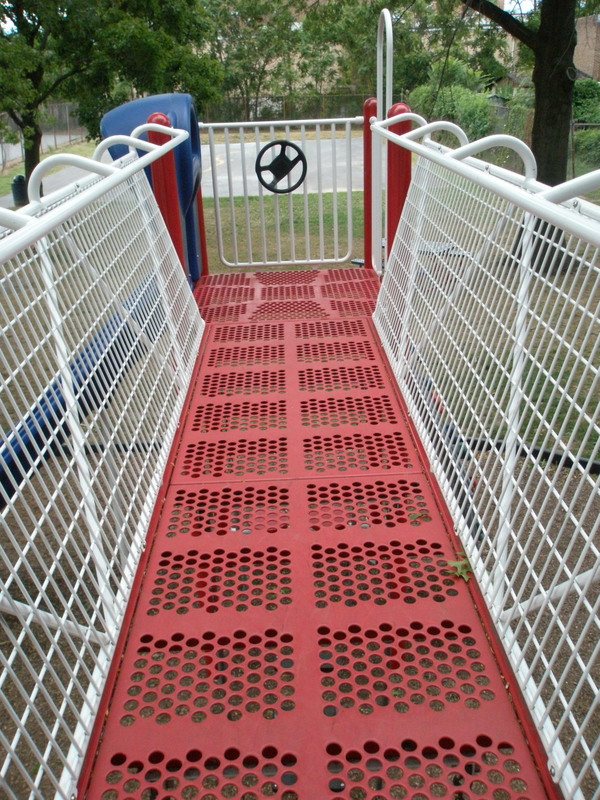 Activities + tips: Lower playground seems more appropriate for younger children. Locals report excellent sledding conditions on the hill! 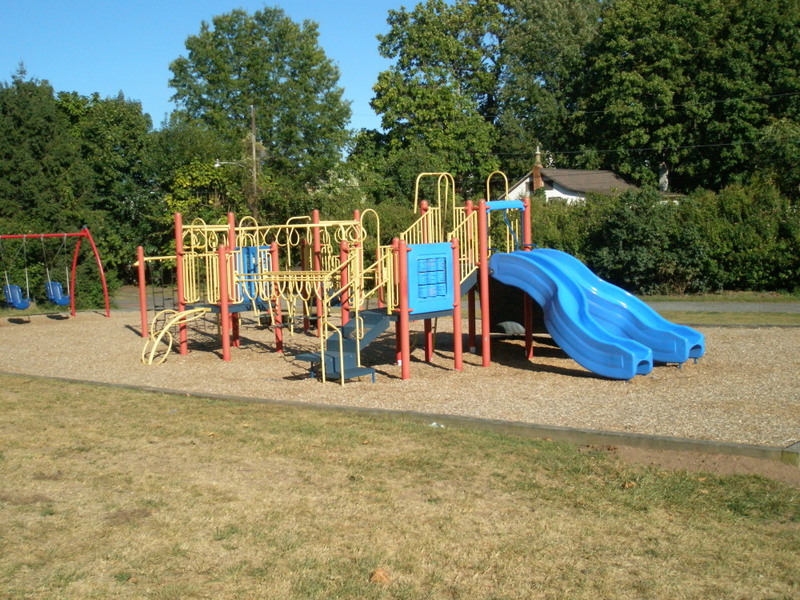 Facilities: Playground, swings, picnic tables, benches; shady and sunny areas; small, grassy multi-purpose open space with slight downward slope. Activities + tips: New fencing along East Street prevents younger children from running into the street. Facilities: 2 sets of play equipment; multi-purpose, grassy space; paved area and pavilion with electricity; mini-amphitheater; community flower gardens & lovely landscaping. Activities + tips: Call the rec. dept. for information on rentals. Pitch in if there’s a community gardening day next spring! Hours: Dawn to dusk; sometimes later for groups with event permit from Rec. Dept. 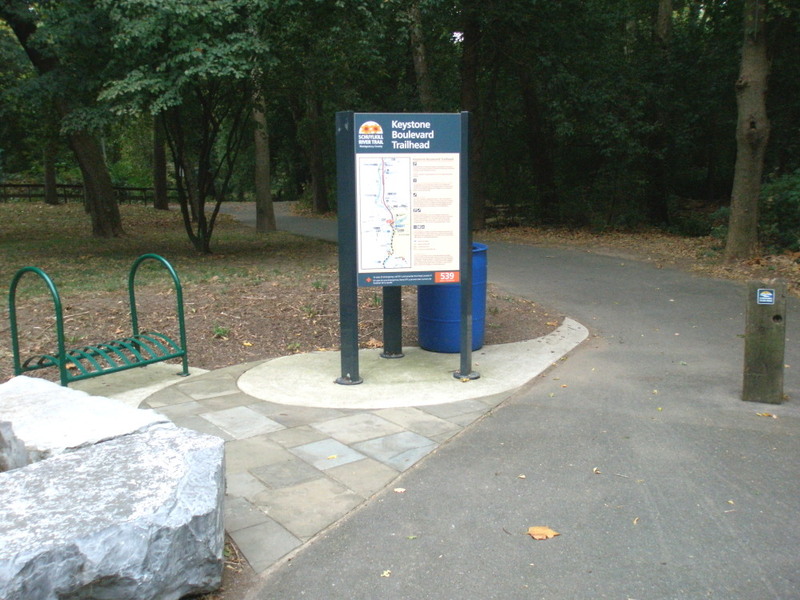 Facilities & Activities: Paved path, open space; seems to be used mainly as a pedestrian pass-through. Tips: Small site owned by Pottstown School District, which is currently doing District-wide facilities analysis. Check out the cool former school buildings across the street! The brightly-colored mural at 140 College Drive in Pottstown is your signal to turn into the parking lot and bring yourself closer to the beauty and tranquility of Riverfront Park. 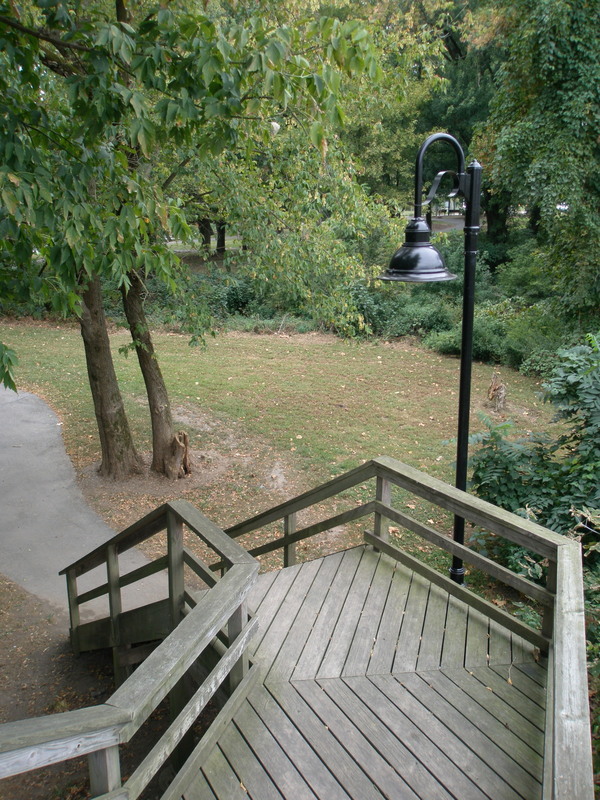 This 60-acre public park offers a wooded oasis with biking and walking trails, sitting areas, a pavilion with picnic tables, an amphitheater for outdoor performances, and a chance to re-connect with the Schuylkill River, long a part of Pottstown’s industrial and recreational heritage. 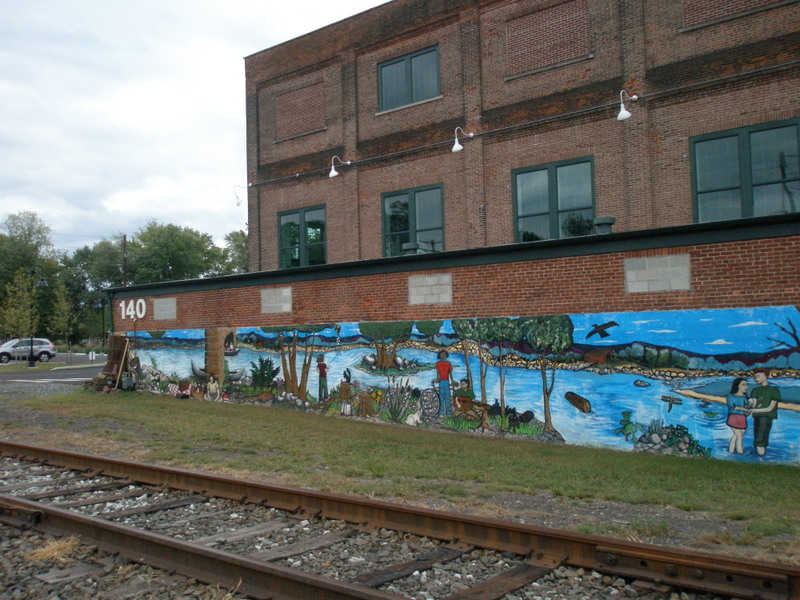 The building with the mural is occupied by the Schuylkill River Heritage Area, which manages the Schuylkill River Trail, a path that will eventually stretch 130 miles in southeastern Pennsylvania from Philadelphia to Pottsville. To learn more about the trail itself, see their website here. 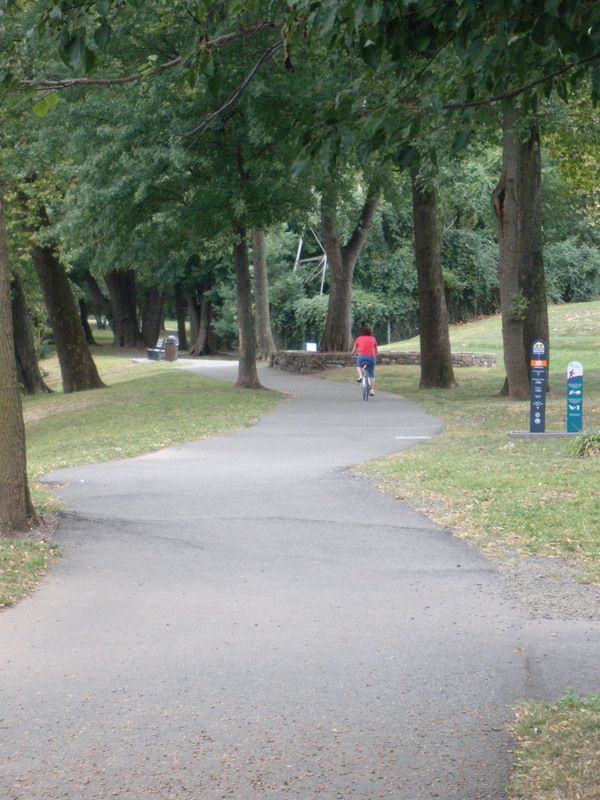 While the Schuylkill River Trail Council manages the trail itself, various county and local parks and recreation departments maintain the parks through which the trail winds. 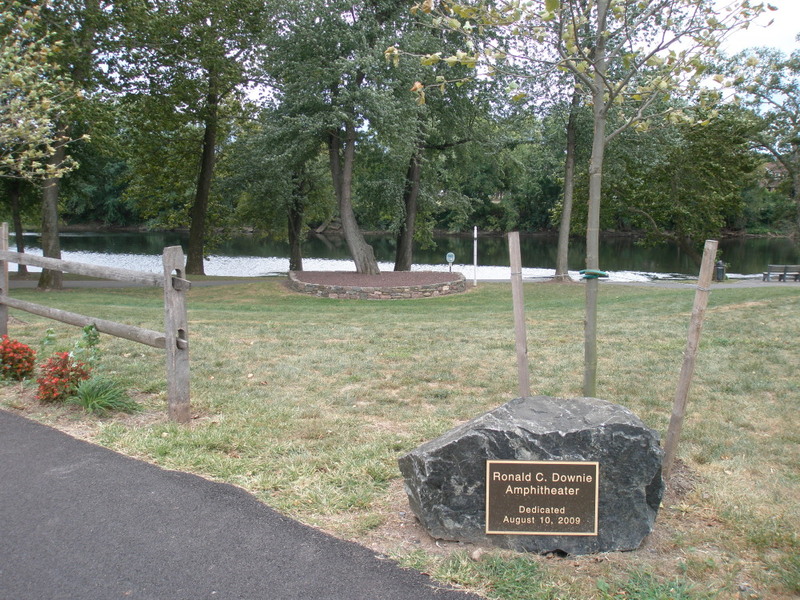 In Pottstown’s Riverfront Park, the Pottstown Parks and Recreation Department is responsible for maintenance and stewardship. They are also the agency that handles the requests and permits for all the festivals and events that take place in Riverfront Park and all of the Borough’s parks throughout the year. Families with young children walking and biking together… a teenaged couple walking hand-in-hand… a woman sitting on a bench, gazing at the water… a lone fisherman drifting past. It was a special treat to see an egret take flight in a low and graceful sweep above the water. I caught another glimpse of him at the water’s marshy edge a short time later. I hope you can see him in the bottom, right corner of this photo! From my limited anecdotal experience, I would venture to say that the word is getting out about all that Riverfront Park has to offer. On a chilly day last April, before the parking lot was completed near the Heritage Center, I encountered very few people in the park. It was quite a different story in the past few weeks as college students, adults, families with young children, and senior citizens all took advantage of the many spaces and activities that the park provides. Ideally, everyone would have a park within a half-mile walk (about 10 minutes) of their home. 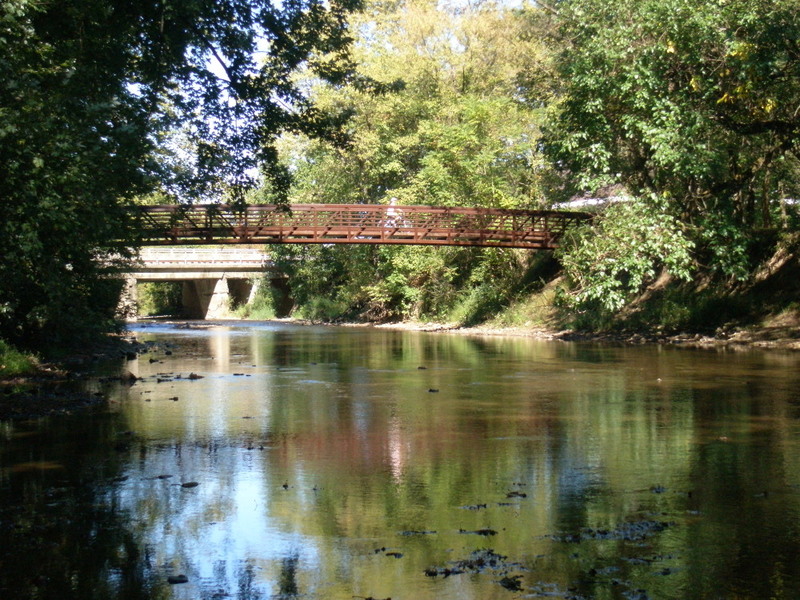 But communities also benefit from regional destination parks, and Riverfront is fast becoming one. The Park hosts the annual Schuylkill River Festival, a community festival that draws thousands of visitors and celebrates the arts, food and music, and also offers demonstrations about available recreational opportunities on the river. This year it will take place on October 9th from 11a.m. 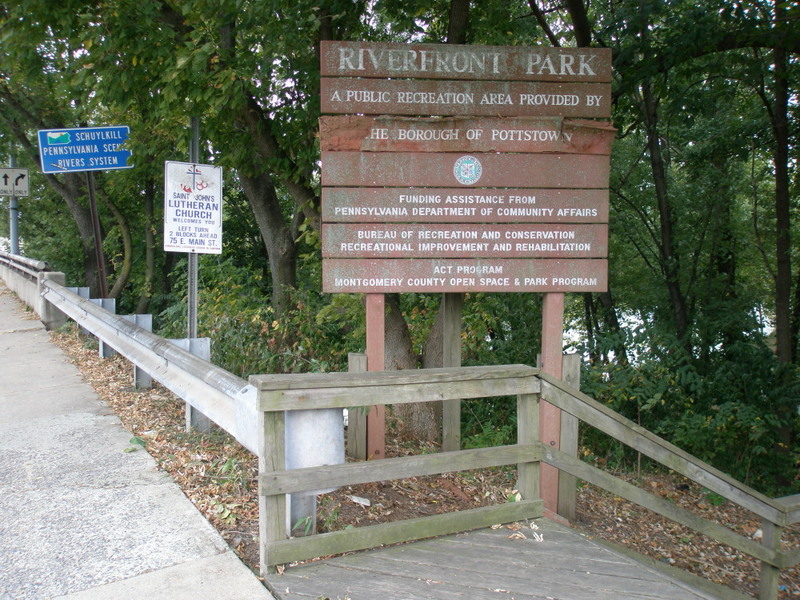 to 4 p.m.
Riverfront Park is the site of Pottstown Parks and Rec’s Halloween fun, known as Halloween Hijynxx and Shiver on the River. The festivities take place this year on Saturday, October 23rd from 4 – 9 p.m. and include children’s games, scarecrow-making, a magic show, haunted hayride and more, which can’t be beat at just $5 admission per person. Come New Year’s Day, the river’s edge is the place to be for the annual Polar Bear Swim and Bonfire, also organized by the Pottstown Parks and Recreation Department. Hearty souls must register and sign a waiver before taking a plunge in the river, with rescue crews nearby, of course. Afterward, “polar bears” and onlookers can warm up at a bonfire and scarf down a traditional Slovak meal of pork and sauerkraut, which is thought to bring good luck throughout the year. You can find Mercury reporter Evan Brandt’s account here. I also checked out this video posted on YouTube, and – seriously? – I feel a Polar Bear throwdown in the making. 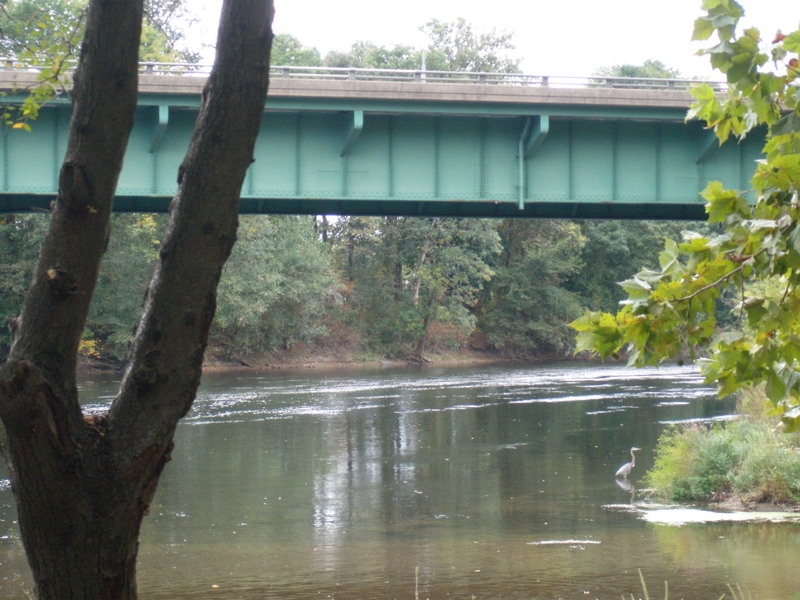 You just might find me in the Schuylkill River (for the first time in my life) on January 1, 2011! So, how do you get to this amazing park? I found three ways to enter Riverfront Park. If you’re coming from High Street, head south on Hanover Street toward the Hanover Street bridge. If you’re on foot, or if you are able to carry your bike down steps, you can enter via the stairway shown in the photo and immediately start to feel like you’ve left urban life behind. Or you can turn right onto College Drive to access one of the other two entries, which each have parking. As noted above, you can turn left into the parking lot at 140 College Drive (the building with the mural). That building is the 1911 PECO generating station that has been, and continues to be, adapted to house the Schuylkill Riverfront Academic and Heritage Center, the result of a partnership between Montgomery County Community College and the Schuylkill River National and State Heritage Area. Or you can drive, bike or walk into the park near the intersections of Keystone Boulevard and College Drive. 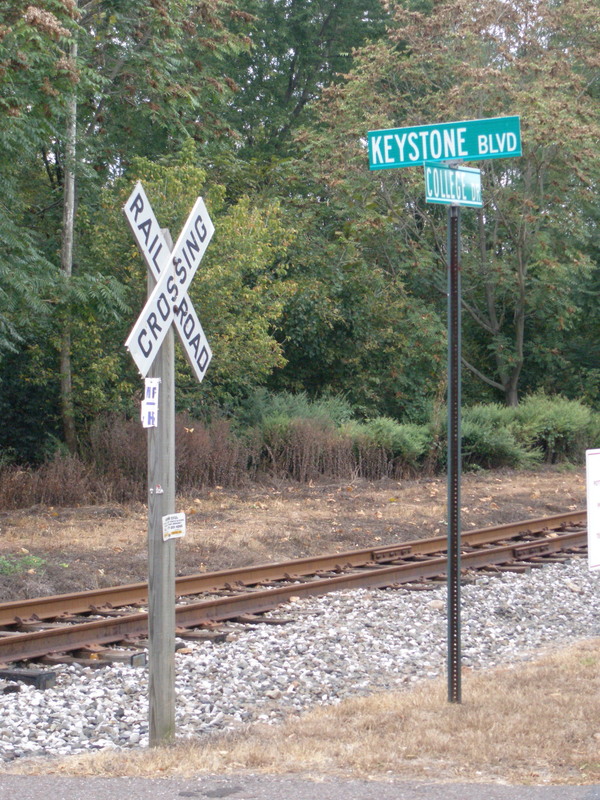 Make the turn, cross the tracks near the overpass, and you’ll be in the park. 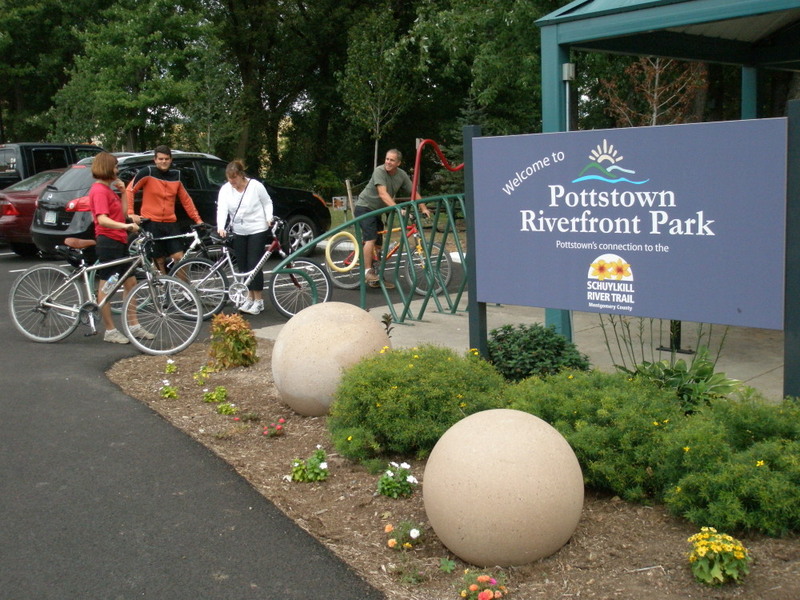 Riverfront Park is the newest addition to Pottstown’s outstanding parks system and, with its burgeoning programming, has the potential to become a regional destination with year-round activities that appeal to residents and visitors of all age groups and activity levels. I strongly encourage you to check it out, both for its current programs and also as the site for your next hike, special gathering with friends and family, or secret spot for daydreaming on a sunny afternoon. 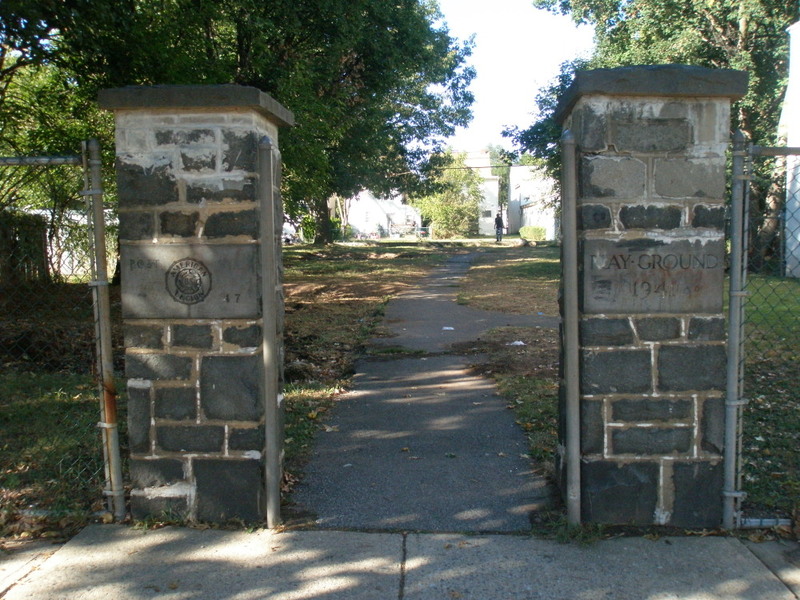 Location: Along College Drive, between Hanover Street and Keystone Boulevard. Use 140 College Drive, Pottstown, PA 19464 to find it on a map. 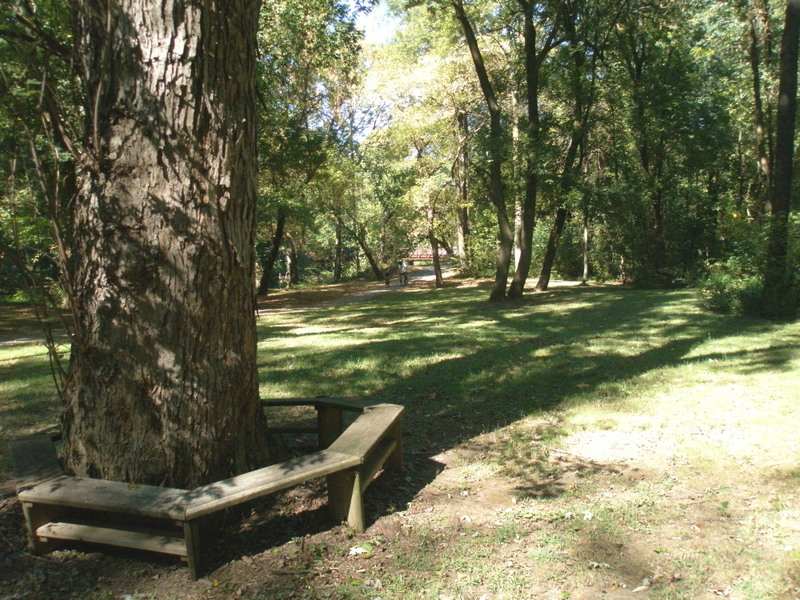 Facilities: Amphitheater, small multi-purpose open space, river, internal trails, picnic areas/tables, picnic pavilion, sitting areas, people-watching areas, natural study areas. Activities + tips: Shaded, paved path ideal for strollers, walkers, joggers and bikers. Some internal, dirt trails with small jumps that seem to be used by dirt-bikers. These trails are suitable for hiking, although there are no trail maps; if you give these a try, be sure to go with a friend or two. 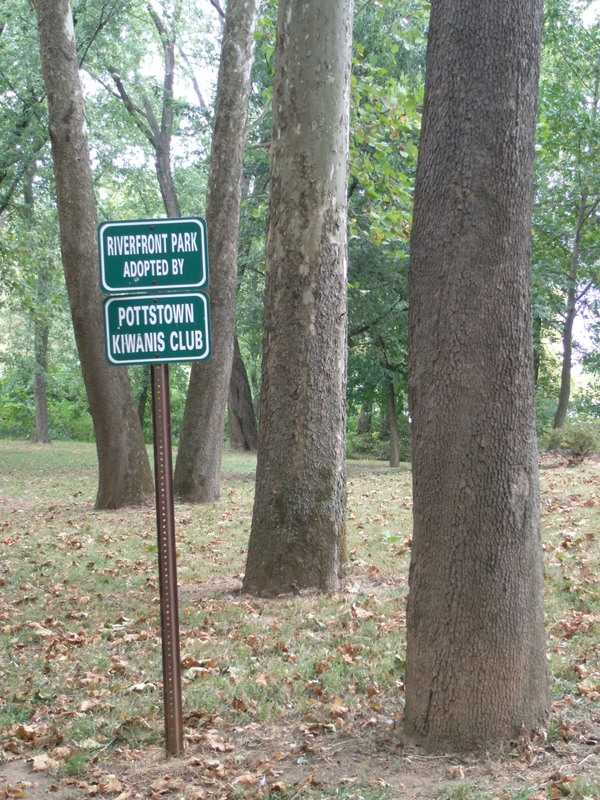 Thank you, Pottstown Kiwanis Club! 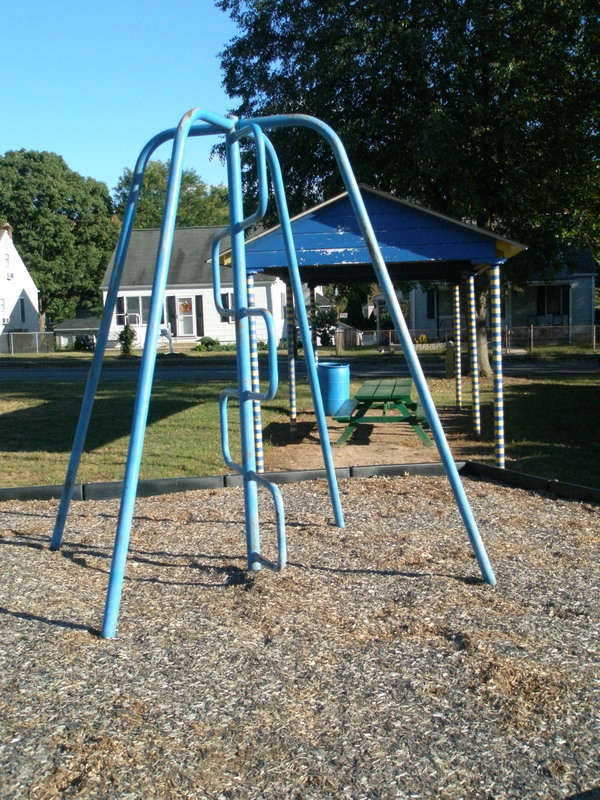 Positively!Pottstown has teamed up with the Pottstown Area Health and Wellness Foundation to run a series of articles about the parks and recreational opportunities in the Foundation’s service area, which includes the Borough of Pottstown and municipalities within a ten-mile radius. Bloggers Sue Repko and Rosemary Keane are visiting all the parks in a recent study commissioned by the Foundation and conducted by the School of Architecture and Landscape Architecture of The Pennsylvania State University. They will be posting their experiences and photos here at Positively!Pottstown, beginning tomorrow and continuing through the first week of November. 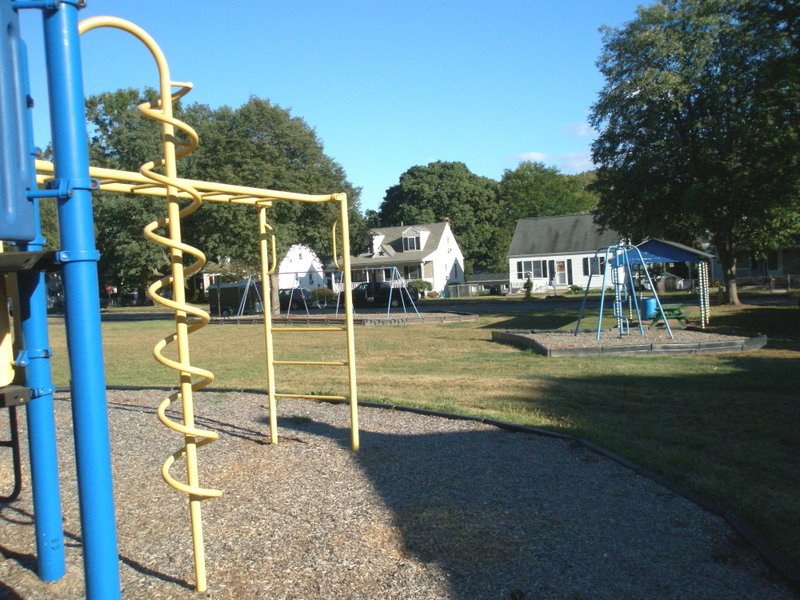 Each week the blog will feature the parks in one municipality or geographic area. 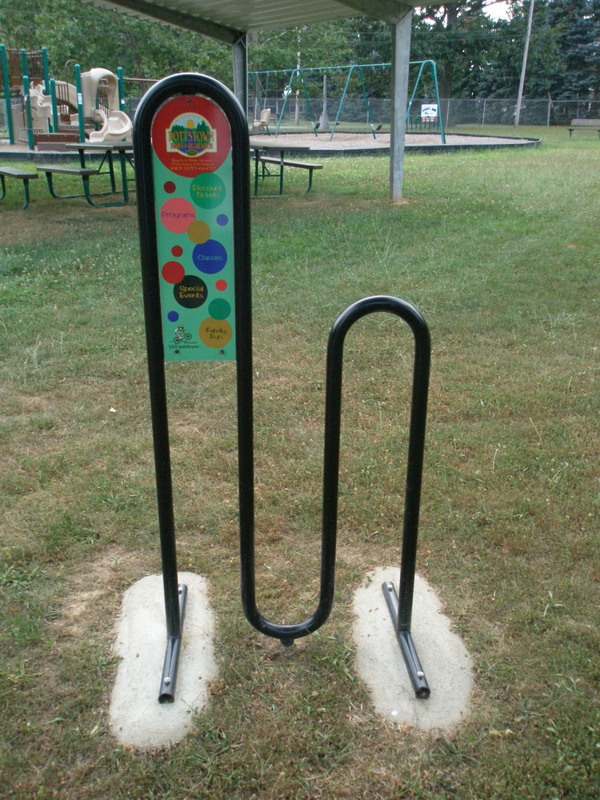 The posts will also appear in the print edition of The Mercury, as space allows, and will otherwise employ new social media, such as the Foundation’s Mission: Healthy Living website, the online edition of The Mercury, Facebook and Twitter, to get the word out about the types and locations of recreational facilities in the Pottstown area. 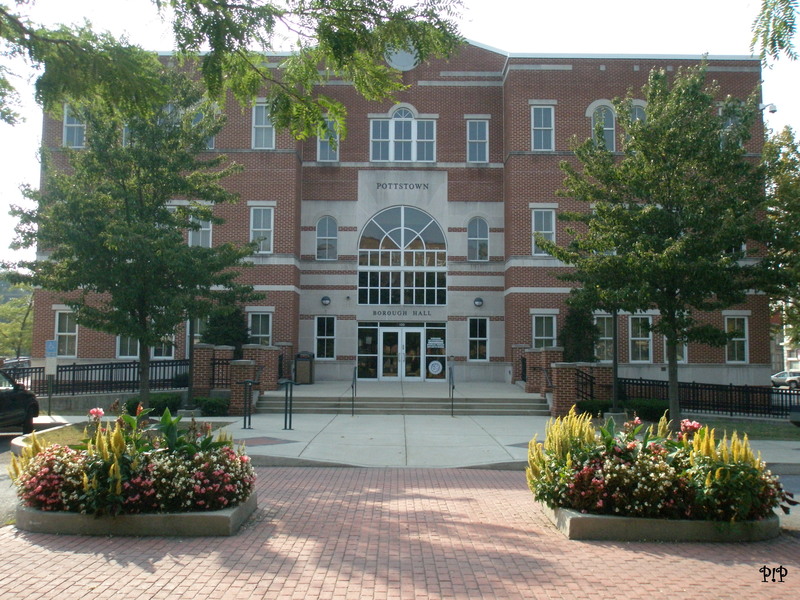 This series is a direct response to some of the findings from Penn State’s two-phase study. Phase I identified critical issues facing the Pottstown area in terms of growth, sprawl, active living and access to parks, while Phase II linked the conclusions of Phase I to planning objectives, recommendations, design guidelines and implementation strategies. One of the key planning objectives to come out of the Phase II Report was to build awareness of nearby parks. The first question a potential park visitor is going to ask is, “Are there any parks nearby?” Surprisingly, one of Penn State’s findings was that more than a third of residents in higher-density areas, such as Pottstown, are not aware that they have a park within a 10-minute walking distance of their homes. Residents’ next questions typically revolve around how convenient it is to get to a park and whether the park has amenities of interest. 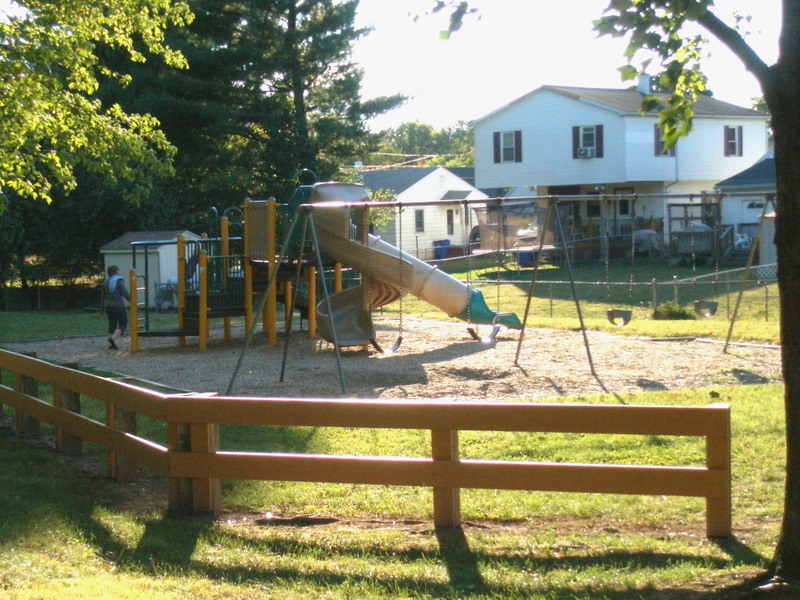 While the Penn State study mentions public and private school playgrounds, the series will not cover those facilities under the assumption that families – the primary users – will already know about them. But the bloggers will use the study as a guide to other community facilities and then will share their own experiences, tips and photos to make it easier for readers to decide what park might suit them on any given day and how to get there. “We wanted to try this approach, to make this fun and engaging for readers, so that they will be inspired to get outside and explore the recreational opportunities in their own backyards and in neighboring towns,” said Dave Kraybill, Executive Director of the Foundation. This project complements the Foundation’s efforts to create an online community, Mission: Healthy Living, where residents can learn and share information among themselves about health and wellness topics that interest them. All of the articles will be permanently available at Positively!Pottstown under the “Parks & Rec” tab at the top of every page, as well as in the “Parks & Rec Series” subject category. Readers are encouraged to share their tips, insights and experiences (both good and bad) in the comment section at the end of each article. 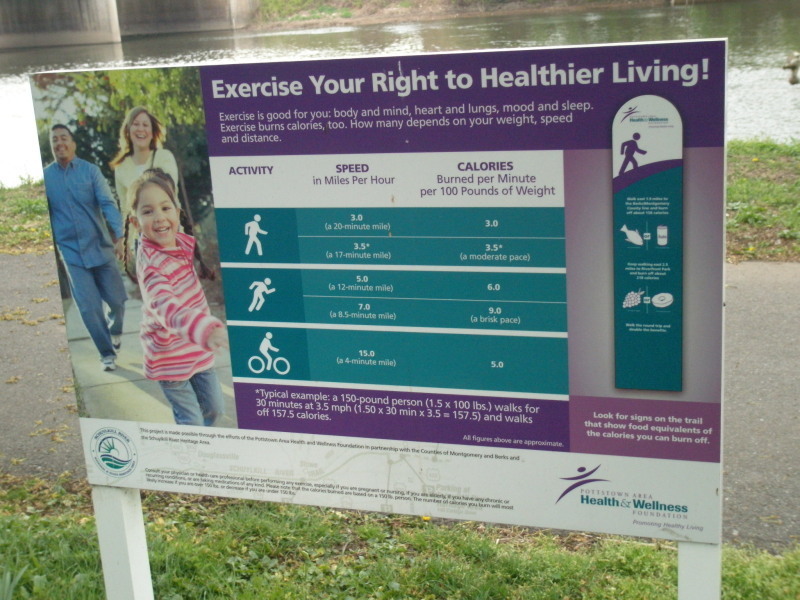 It is through this kind of real-life feedback that municipal officials, parks and recreation departments, non-profit sports and recreation organizations, and the Pottstown Area Health and Wellness Foundation can better understand how to encourage and strengthen the opportunities for physical activity and healthy living in their communities. Follow the parks series at Mission: Healthy Living, Positively!Pottstown, Twitter (follow PositivelyPtown), Facebook and The Mercury. This post picks up from where we left off on Sept. 7, when we looked at how website content/organization might influence potential home buyers/investors. Since then, let’s give credit where credit is due. The web pages of the Parks & Recreation Department have been updated and they look great! Our first look at the regulatory framework for land development tried to set the context in which land & building development take place. There are laws and ordinances that tell property owners what they can/can’t do with property they own or are considering purchasing. They make financial decisions based on their best guess as to how easily they will get approvals and be able to move on their projects. Time is money. Potential investors usually choose the path, or location, of least resistance. In our second look, we went to the Borough’s website as though we were a potential business/property owner to get a sense of what incentives or regulations might impact our decision to locate in Pottstown. We found information that was confusing & not designed to entice people to town. Now let’s go a little deeper into Pottstown’s actual ordinances and processes. I will only be spotlighting a few examples because to sort these out actually requires a complex and longer-term investigation, which is already underway to a certain extent by a committee that includes the Planning Commission, county planner and Borough staff. My understanding is that they are looking at ways to clarify and streamline some parts of the zoning ordinance and their approval and inspection processes. This is very good news. Most people who are tuned into Pottstown’s ongoing land use discussions will have heard complaints about “codes,” “enforcement,” “HARB,” and “the zoning ordinance.” What do they really mean by this? Again, I am just going to give a few examples. Now I have to wonder if this is the beginning of some convoluted red-tape that I won’t get through for several months. Do I really have to do this? The 3-4 week warning is a red flag – what is it about this government’s process that requires that amount of time to get an appointment? 2) HARB = Historic Architectural Review Board. In a town with historic architecture and designated historic districts, this is a good and necessary Board. But I’m not clear on why their approvals/denials go on to Borough Council for another round of review, especially when anecdotal evidence points to the Council never really reversing a HARB decision. If you keep HARB well-stocked with a mix of knowledgeable professionals and citizens, maybe they could be converted to a decision-making body (rather than an advisory one) and entrusted with the final decision, leaving Council available for appeals only. 3) A zoning ordinance is supposed to be based on a Master Plan. A Master Plan is THE community document that spells out the vision for the future across all planning areas: housing, land use, open space, transportation, recreation, historic preservation and more. 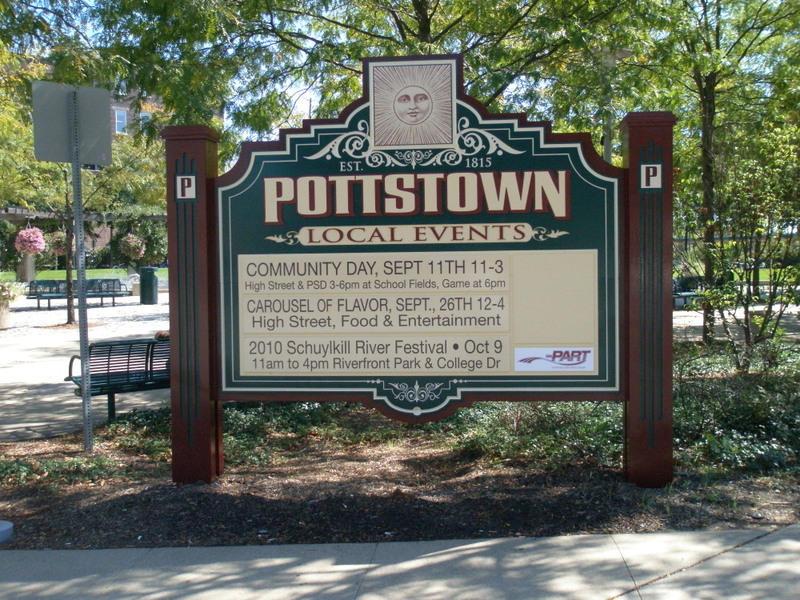 Pottstown has not updated its own Comprehensive Plan since 1986. It now uses the Pottstown Metropolitan Regional Comprehensive Plan as its guiding document; that is in the process of being updated. With all due respect to the intent & spirit of regional planning, without a thoughtful, public master planning process and Master Plan that is very specific to Pottstown, it will be hard to get a handle on what you want your zoning to do for you today, not 25 years ago, or even 10 years ago. Today. As an illustration of how zoning might impact investment decisions by outsiders as well as current property owners, I’m only going to talk about one facet of the ordinance – the Conservation District overlay. It covers three zones: Neighborhood Residential (NR), Traditional Town Neighborhood (TTN) and Downtown (D). 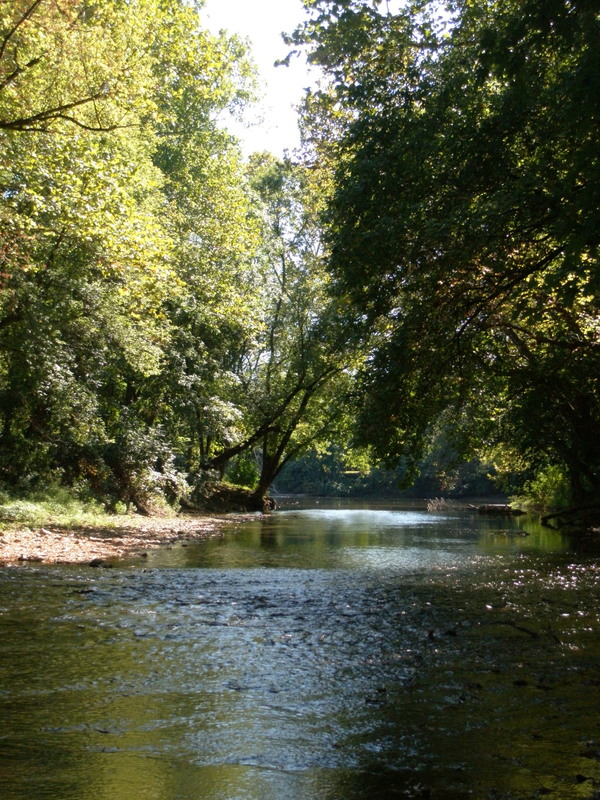 The Conservation District rules are designed to do just that – conserve what already exists. Again, with all due respect, it is wonderful that Pottstown provides modest homes to a range of income levels. But virtually all of the North End, East End and West End – all the “Neighborhood Residential” (NR) areas on the Zoning Map, fall under the “Conservation District” overlay. If you look at the stated intent of the Conservation District in Sec. 302 on page 27-14 of the Zoning Ordinance, you can see how a discussion of actual historically-significant properties somehow morphs to include properties that just happen to be more than 50 years old. First, just because a building is more than 50 years old doesn’t mean it’s worth “conserving.” Second, having such a tight rein on what property owners can do with their own property (that is NOT in a Historic District) results in a dampening effect on the reasonable movement of the free market, which includes outside investors as well as current property owners looking to increase the value of their asset. I am in no way advocating for a free-for-all, teardown/McMansion scenario. But ordinances can be written to facilitate, rather than hinder, appropriate, planned redevelopment of at least some areas where the existing housing stock may never appeal to the higher-income consumers you say you want to attract to the Borough. What specifically is in the Conservation District language? Take a look at the Zoning Ordinance. At the bottom of page 27-15 and the top of page 27-16, there’s a description of the review procedure for any work proposed on any building in a Conservation District. It specifically includes the installation of fences. I’m not sure if this is actually carried out this way. I have heard that fence applications go to Planning, which is a problem right there. I don’t think I can name any other place where a fence application goes to a Planning Commission. In Pottstown’s ordinance, because Planning is an advisory body, not a decision-making body, a final fence decision seems to have to come from Council. It says it at the top of page 27-16. I doubt this works this way in real life. Regardless, it should be taken off the books. Moving down the page, the restrictiveness of the Conservation District becomes apparent when you look at the Conservation District Summary Chart. The general requirements are to “conserve,” to keep additions or new buildings in scale, size, and materials consistent with what already exists. This makes perfect sense for districts or zones with truly architecturally significant buildings. This does not make sense for an entire town. Basically, next to no housing in Pottstown can ever break out of the mold that was set in the 1940s and 1950s in all those neighborhoods that are not even near any Historic District. To conclude… it seems like there’s an unraveling and across-the-board re-thinking that needs to take place regarding what the town wants to be/look like. Then, the town can re-consider all of its zoning and land use approval processes in that light. It looks to me like the land use and development areas could benefit enormously from a process similar to the one the Borough undertook to analyze and re-order its financial systems. These efforts bring clarity, streamlining and accountability. It’s good government. Visioning & master planning help you to articulate what you want your community to be in the future. The changes that need to be made to land use ordinances and systems will become more apparent if you know what you want to achieve as a community. Next up: Current planning documents, or the reports that everyone needs in front of them if they want to talk about revitalization & development in the Borough.